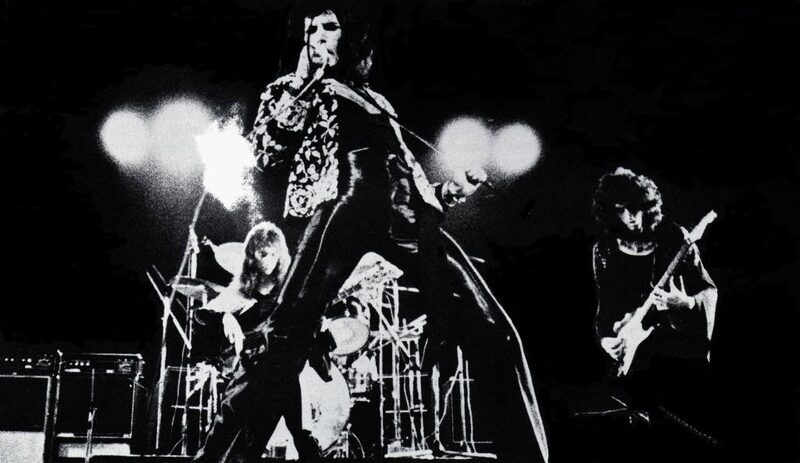 This show at the Rainbow Theatre was Queen's first "big" headlining gig. 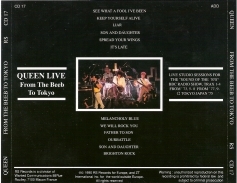 The show was properly recorded and was later proposed to be the band's first live album, but ultimately shelved. 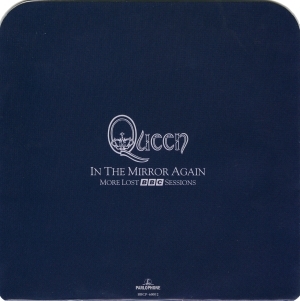 It was eventually released officially in 2014. 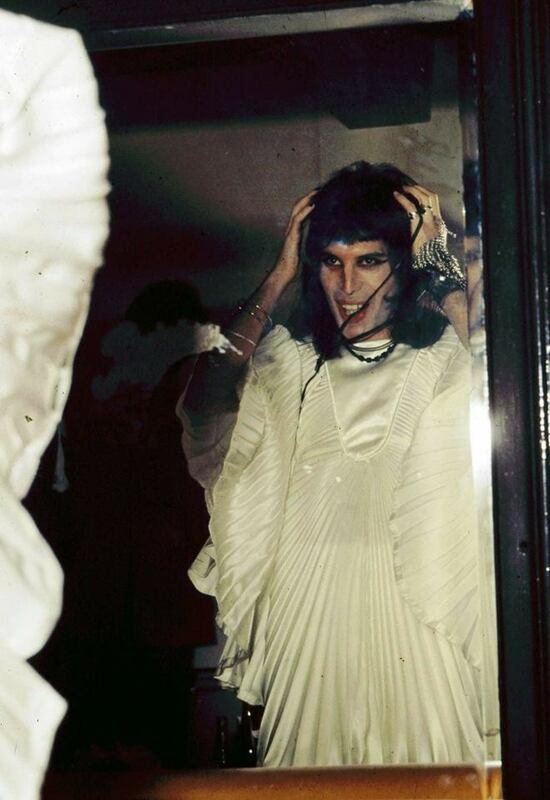 Freddie is seen in an elegant new white outfit at the beginning of the show, created by designer Zandra Rhodes. 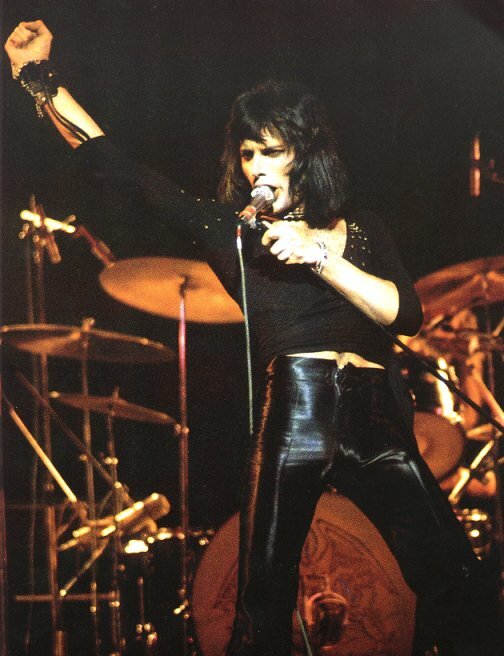 Rhodes explained in 2013, "I hadn't designed any menswear before then, but I realised he'd need a flamboyant look." 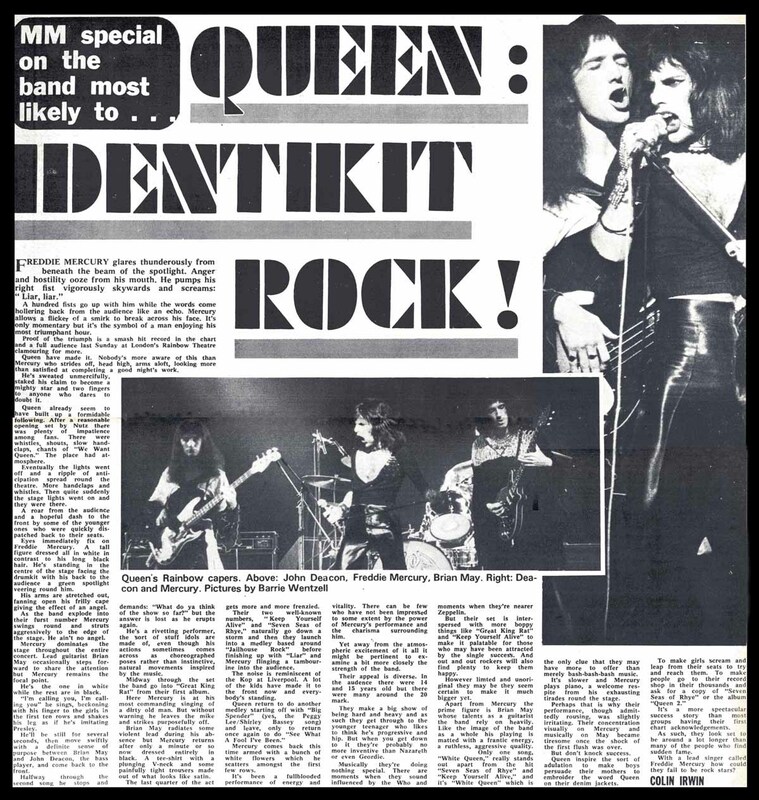 She would design outfits for the rest of the band for their next UK tour in the fall. 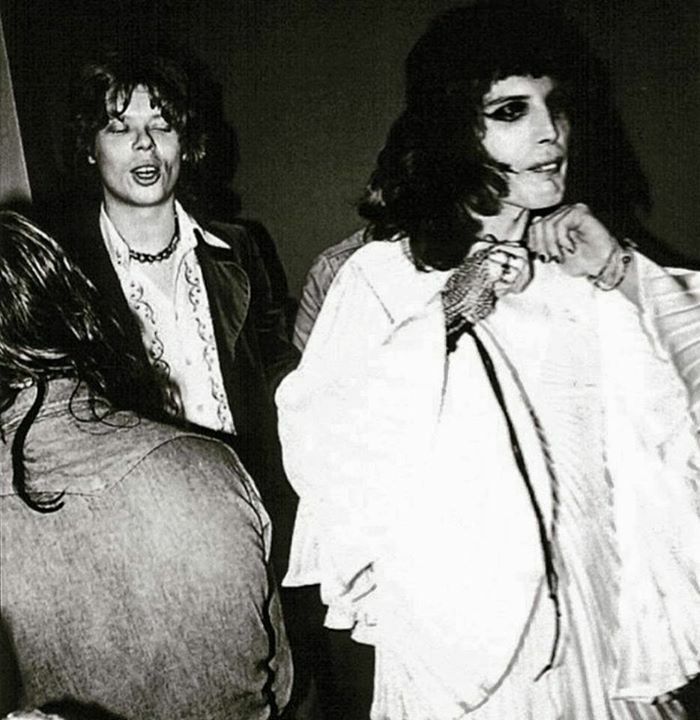 "What a night! 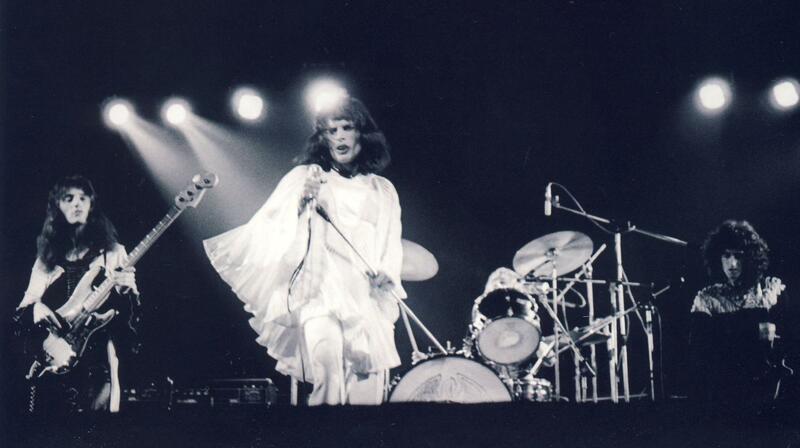 It was a finale of the big Queen tour throughout the whole country. 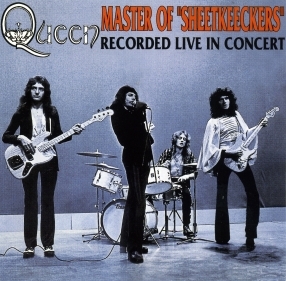 It was the conclusive evening for their reputation. 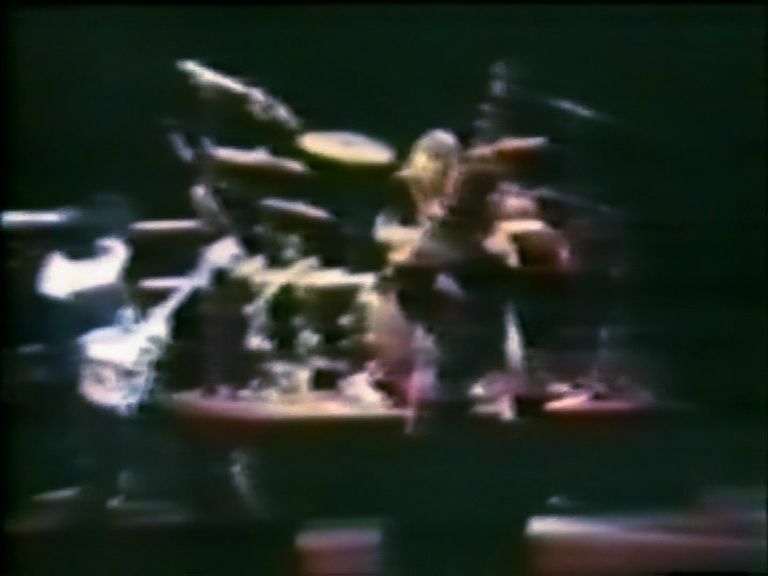 Their lift was meteorical. 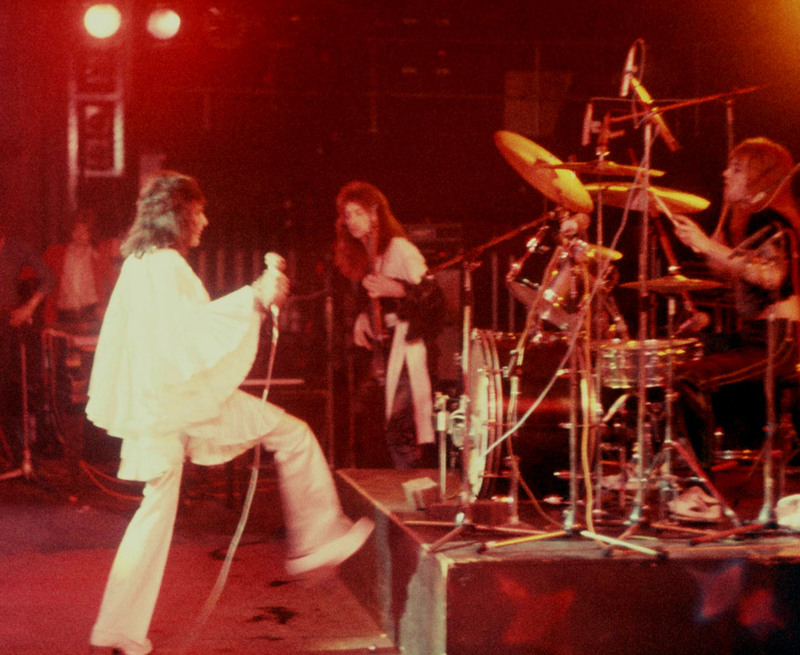 So many people had challenged if Queen had the authority to play in such a prestigious place as the Rainbow. 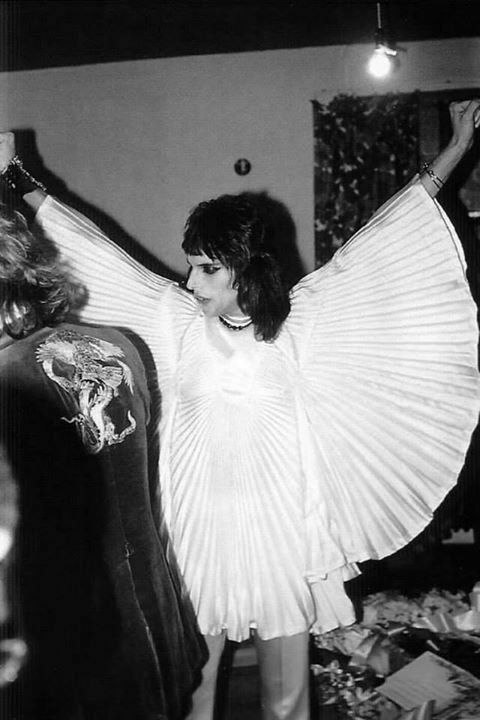 Freddie appeared in his new specially eccentric white "eagle's" costume, bouncing and miming with even bigger ecstasy than ever and sang even better than any time before. One couldn't believe it's the first time of Queen appearing themselves in such an important place. 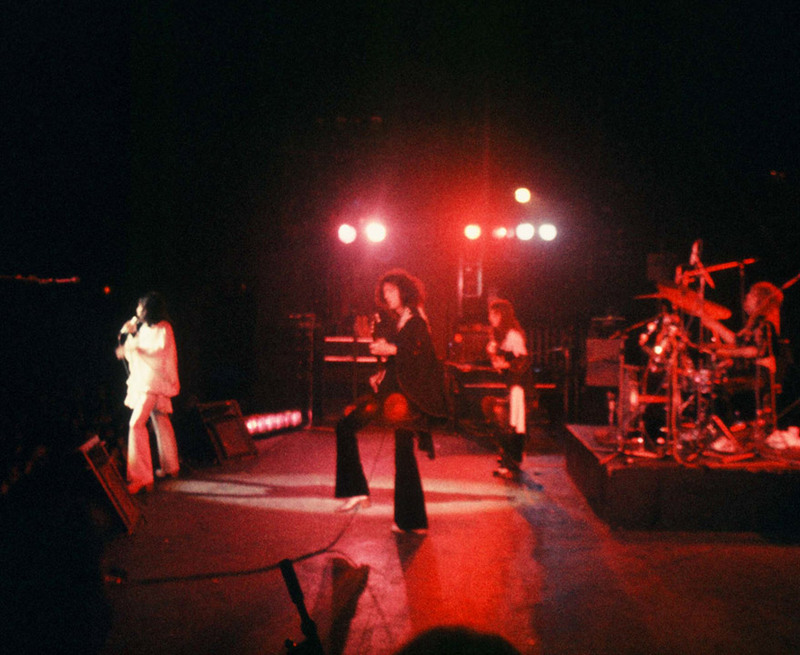 After a while they got used to taking advantage of the big stage. 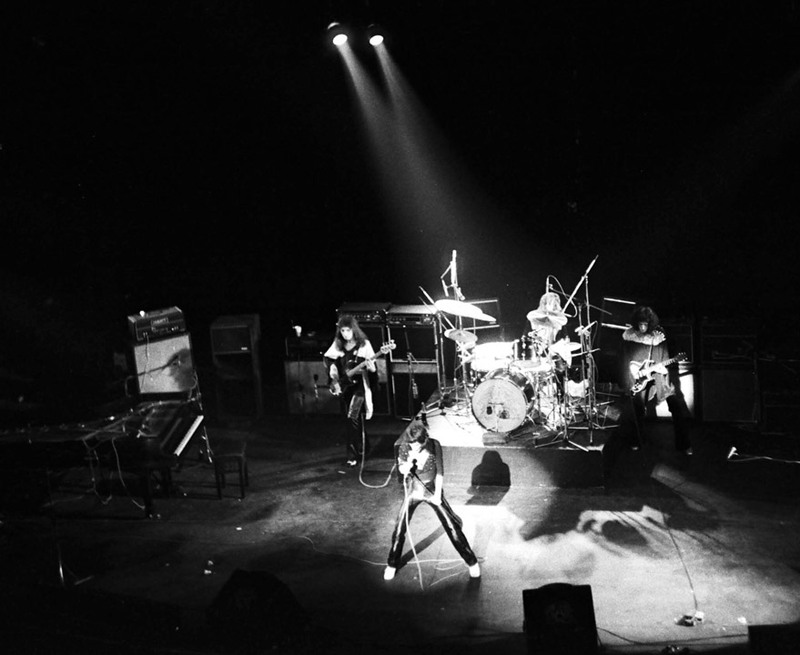 After two encores they left the stage during a big applause of the audience." 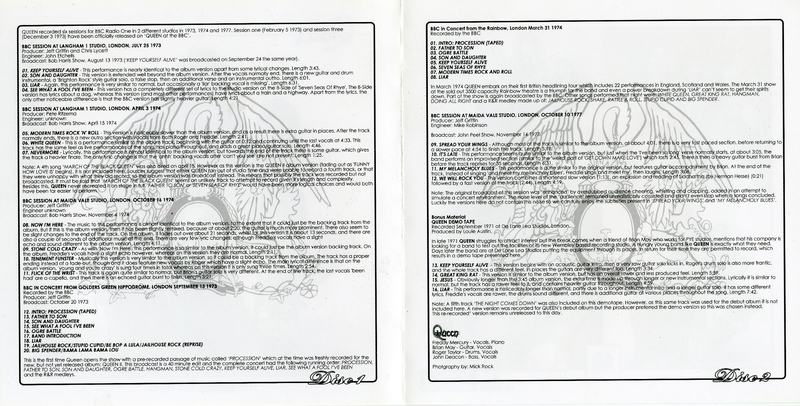 The review notes that Freddie quickly changed from his white outfit to a black one during Brian's solo during near the end of Great King Rat. 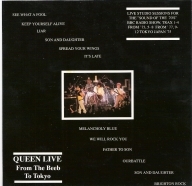 On the next couple tours he would change during Son And Daughter, as it was a much longer frame of time. 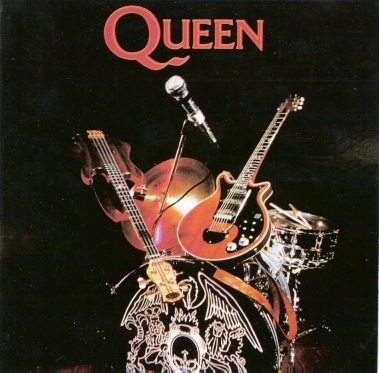 His white and black looks complement the running themes of the Queen II album, both visual and conceptual. 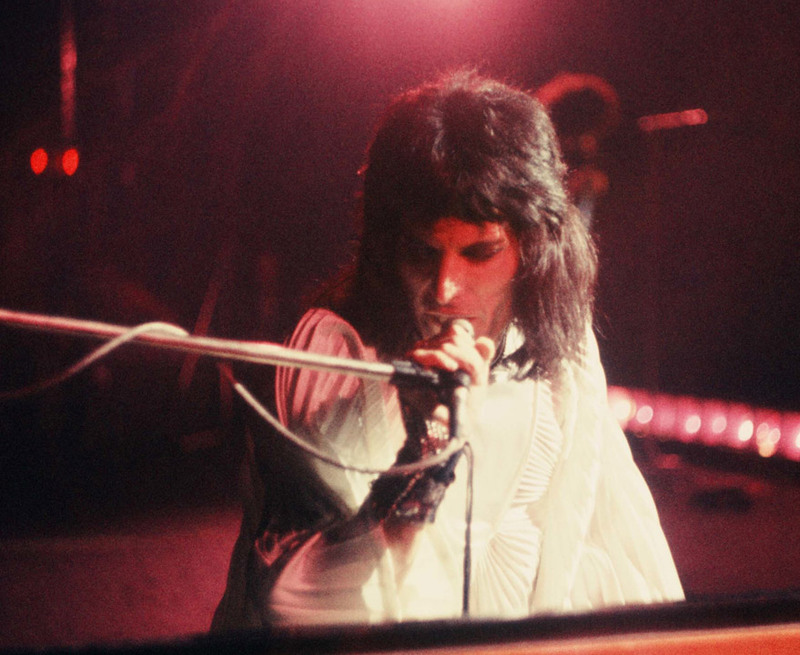 Also mentioned in the review is Freddie throwing flowers into the audience during the encore. 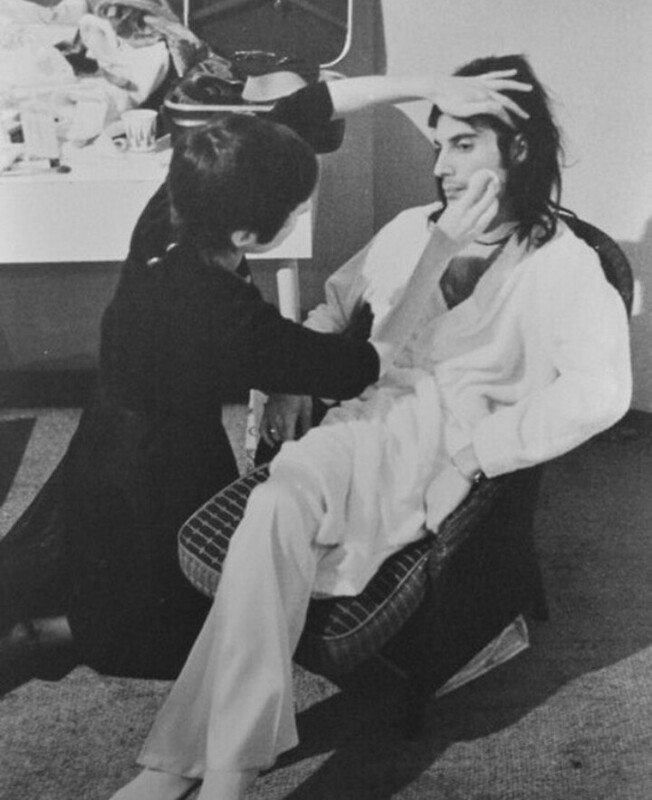 By 1975 he would be throwing red roses whose thorns had been plucked out one by one by a crew member. 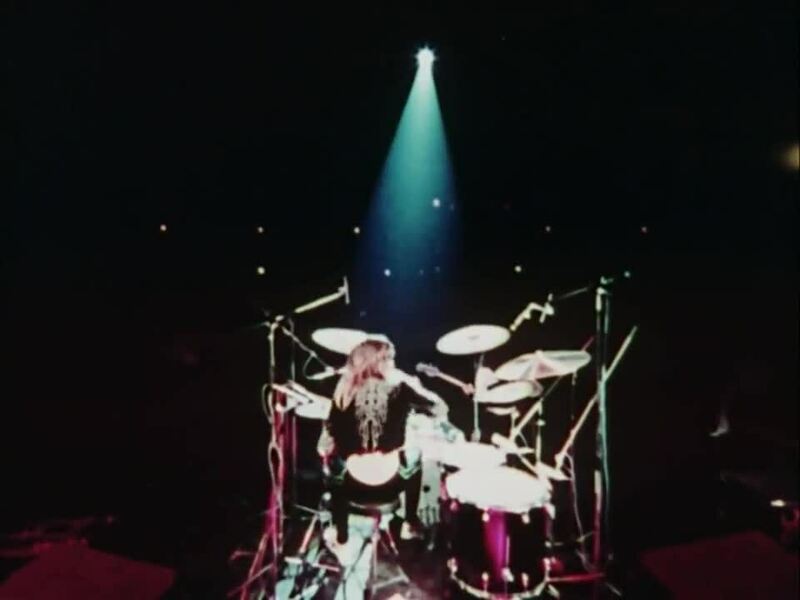 Roger Taylor's energetic Modern Times Rock 'n' Roll is played at this show. 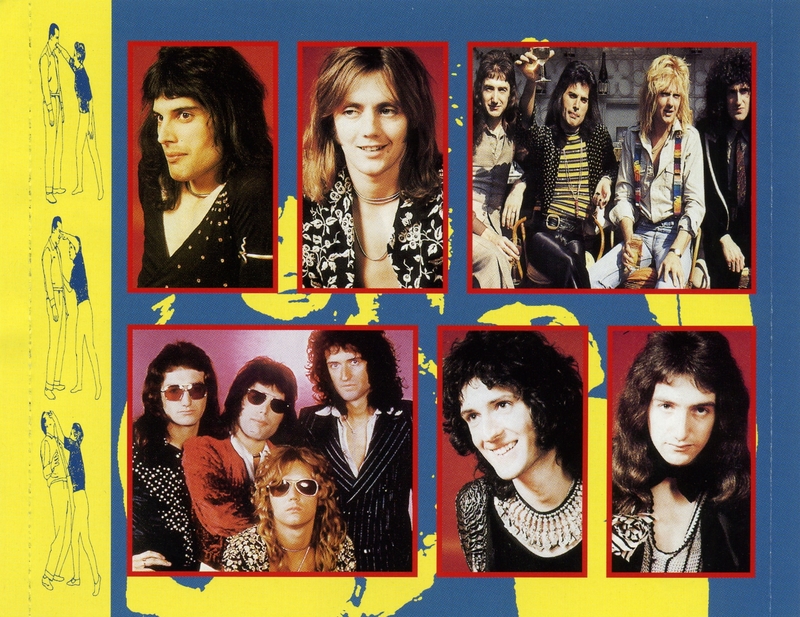 While the studio version had Roger doing the lead vocal, Freddie would sing it in concert. 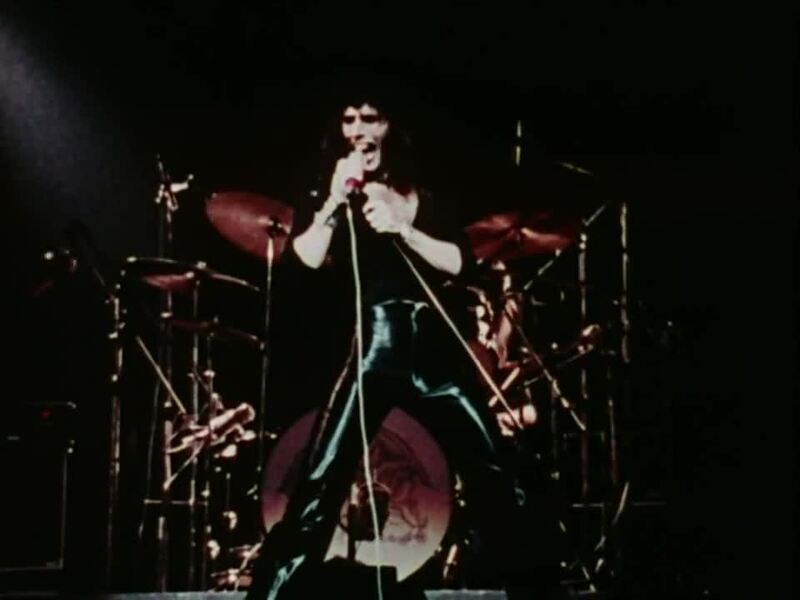 The vocal line had to be rearranged, as his vocal range is not nearly as high as Roger's. 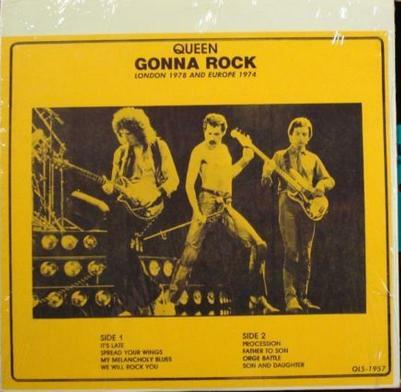 The song would be performed often over the next few years. 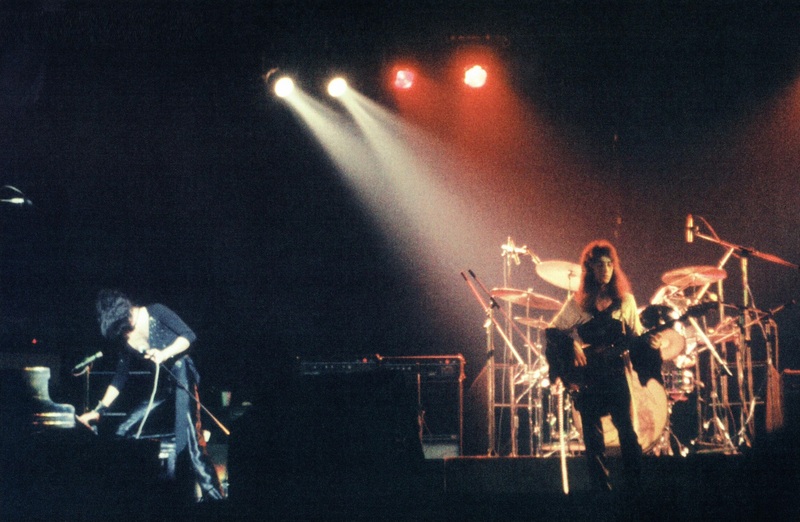 "We'd like to end with a number we usually end with, for those who've seen us. 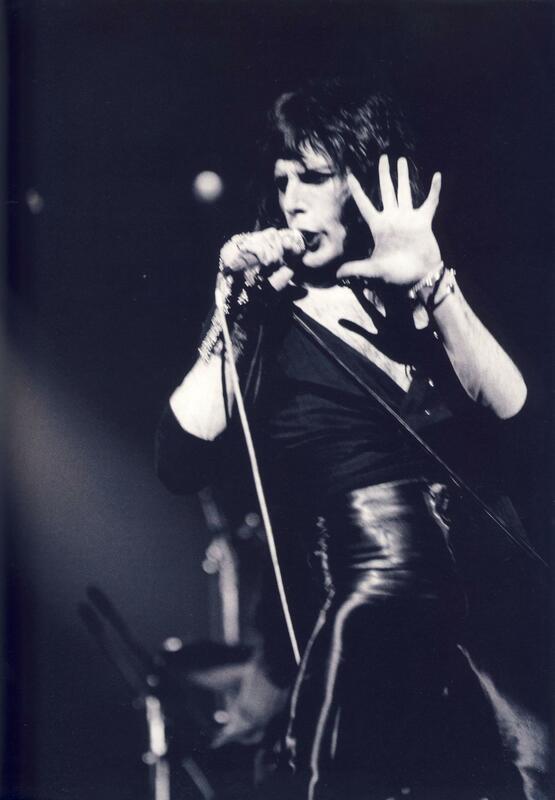 It's called Liar," declares Freddie. Brian breaks a string around the breakdown of the song (when Freddie sings "Listen!"). 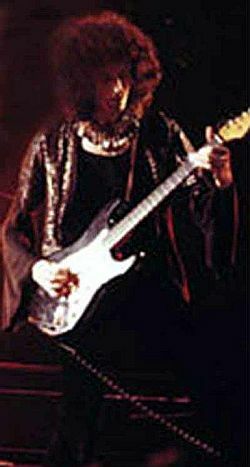 He unplugs and switches to his Fender Strat, as seen in the last two pictures above. 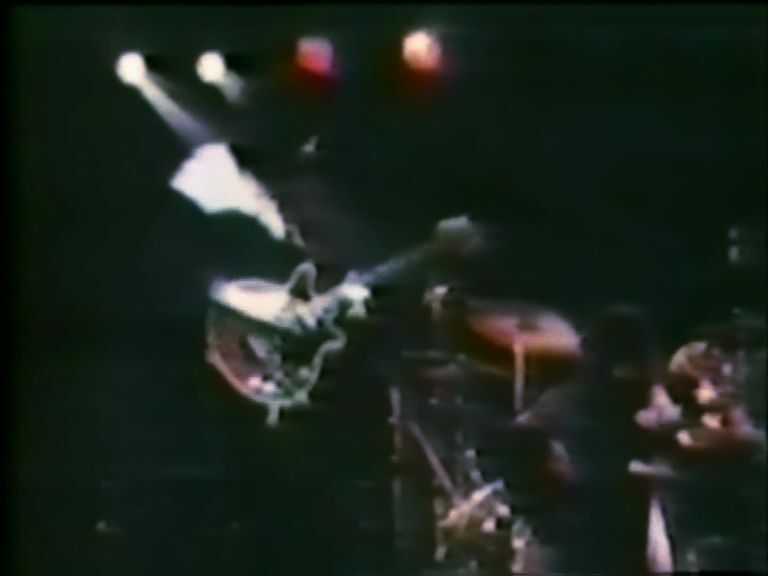 His tone is much different from this point onward. 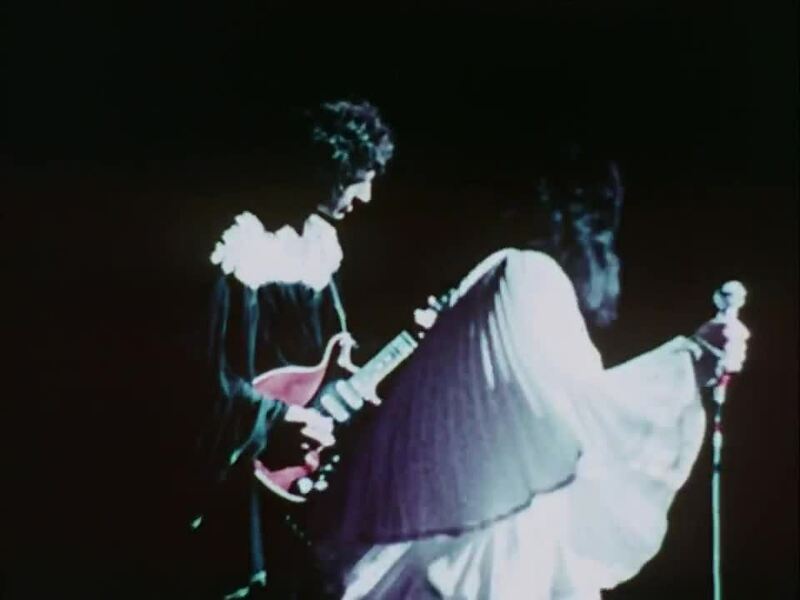 For years it has been said that the power went out during Liar at this show, but this actually occurred at one of the Rainbow Theatre shows in November. 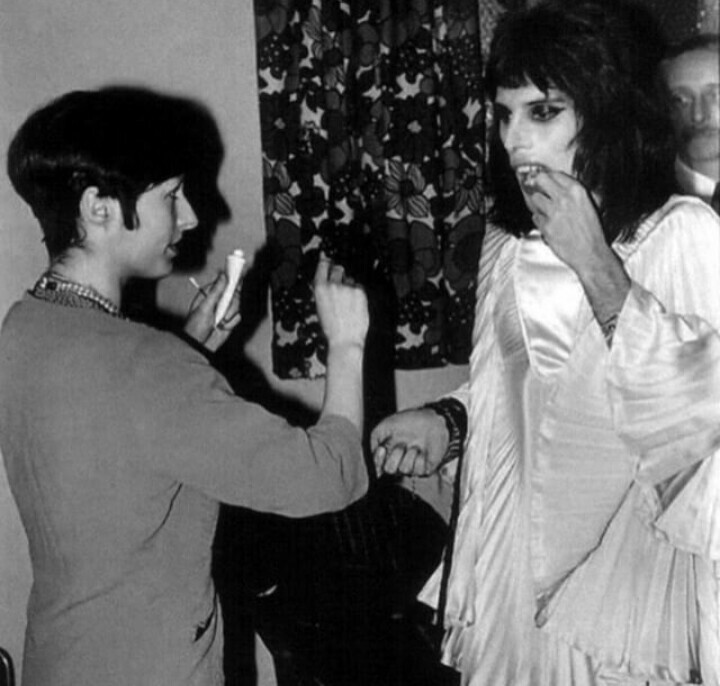 After the show, a teenaged Simon Townshend, younger brother of The Who's Pete Townshend, told Freddie Mercury backstage that Queen were "much better than my brother's band." 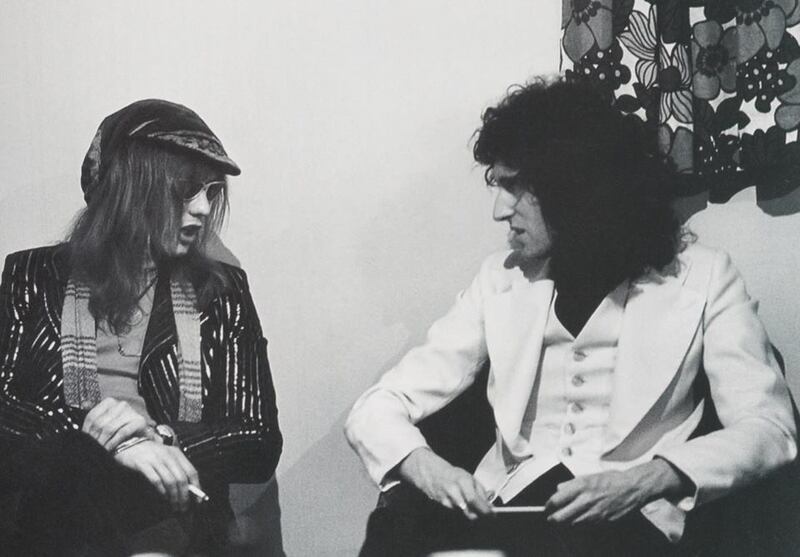 Freddie was thrilled with the compliment, even coming from a 13 year old. 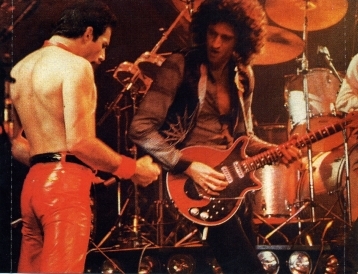 Interestingly enough, in a 2005 Uncut interview, Brian May declared his belief that The Who were the better of the two bands. 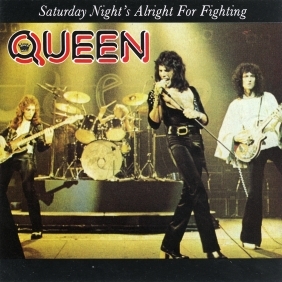 Four tracks from the show were broadcast on US radio in the first week of September 1975, along with an interview with the band. 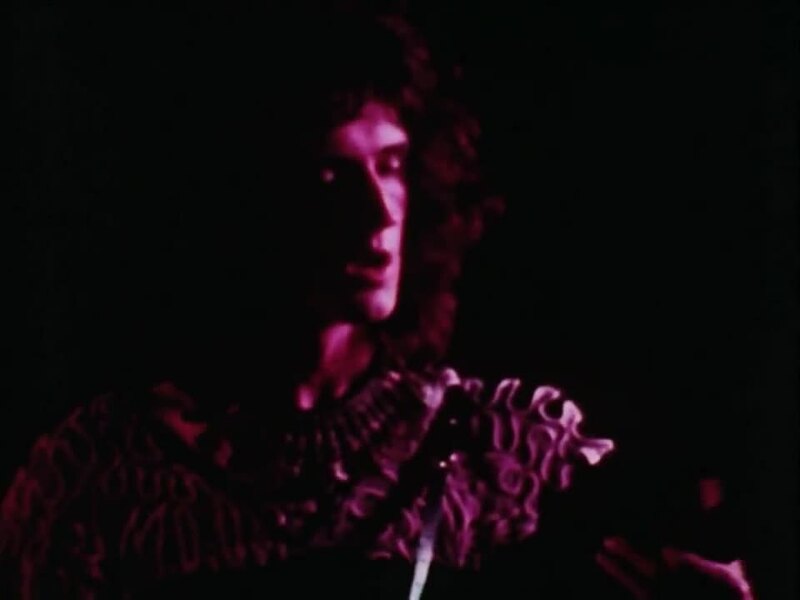 Many years later, Brian May reflected on playing the Rainbow: "We had a dim, distant vision of what Madison Square Garden might be like in America, but really no idea of what it was." 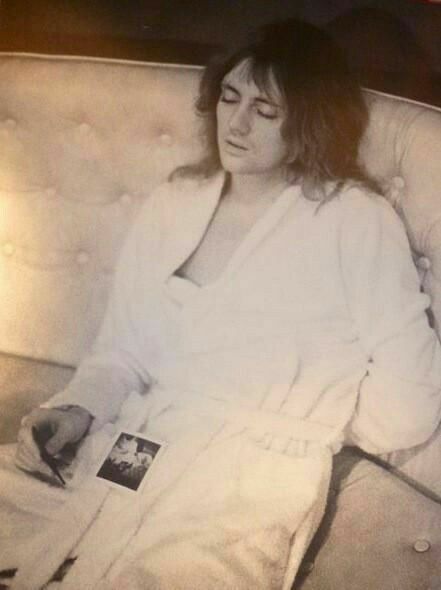 He added, "After that, everything was a bonus. 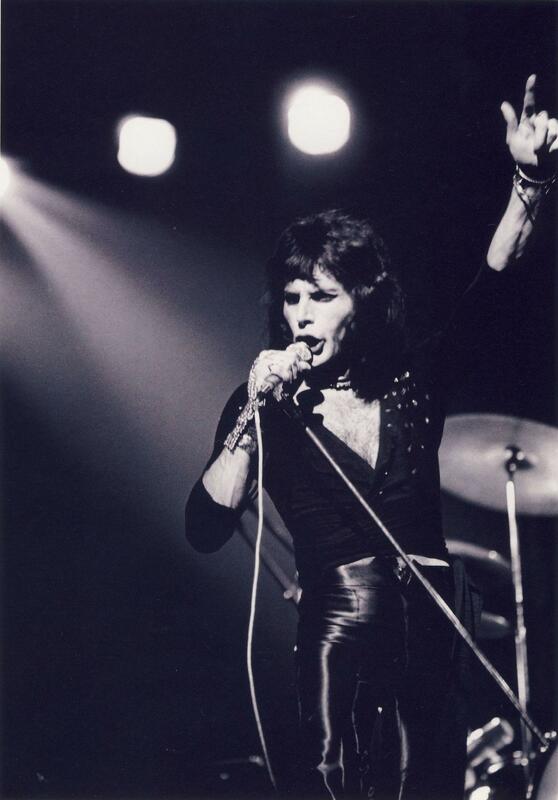 Everything was something which I had never even dreamed about." 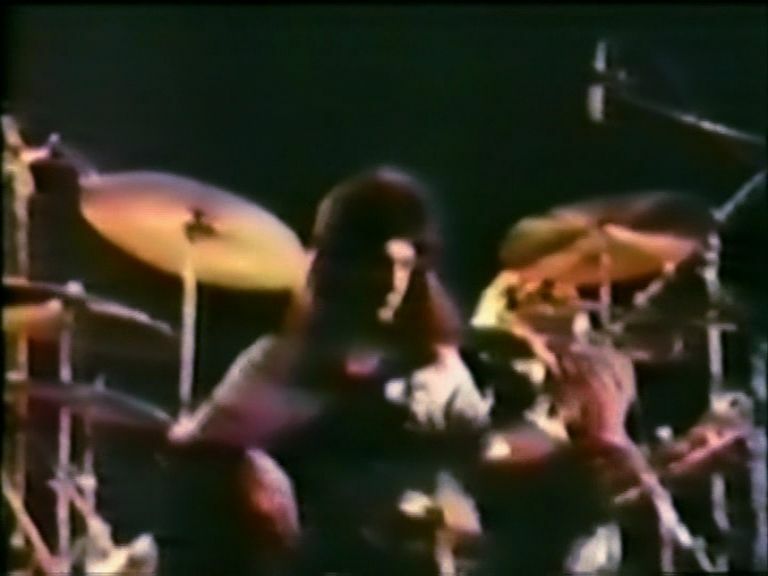 Ten minutes of professional video footage from this show exist - the earliest known footage of Queen in concert. 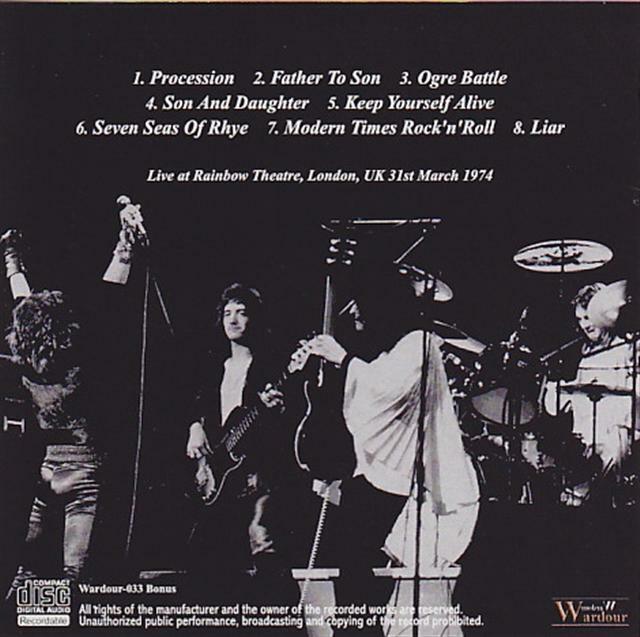 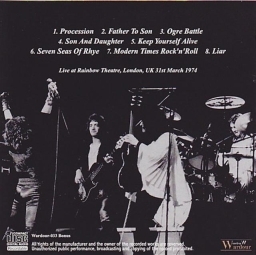 It was included in the 2014 "Live At The Rainbow" release, also containing audio and video of the November 1974 shows at the same venue. 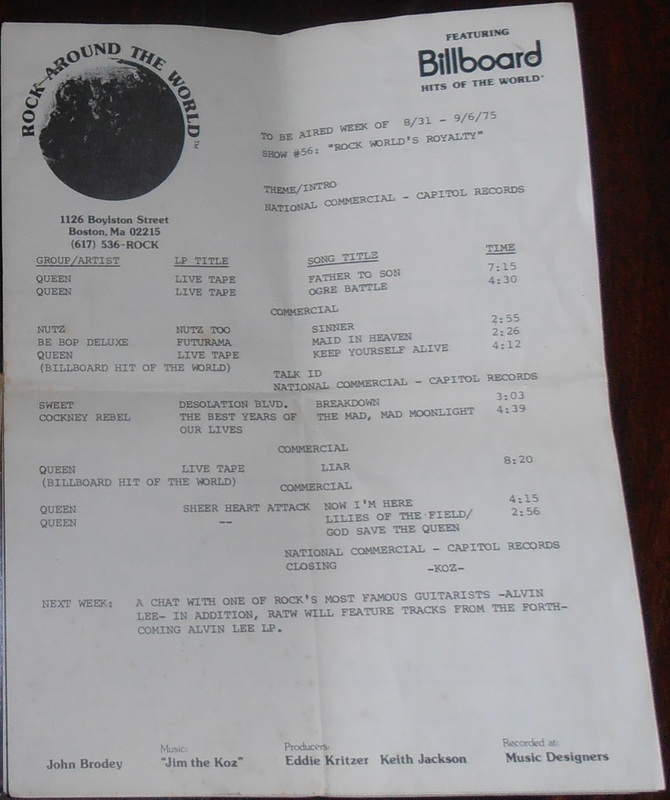 The virtually complete audio of this March show was included as well (only Big Spender and Bama Lama Bama Loo were omitted). 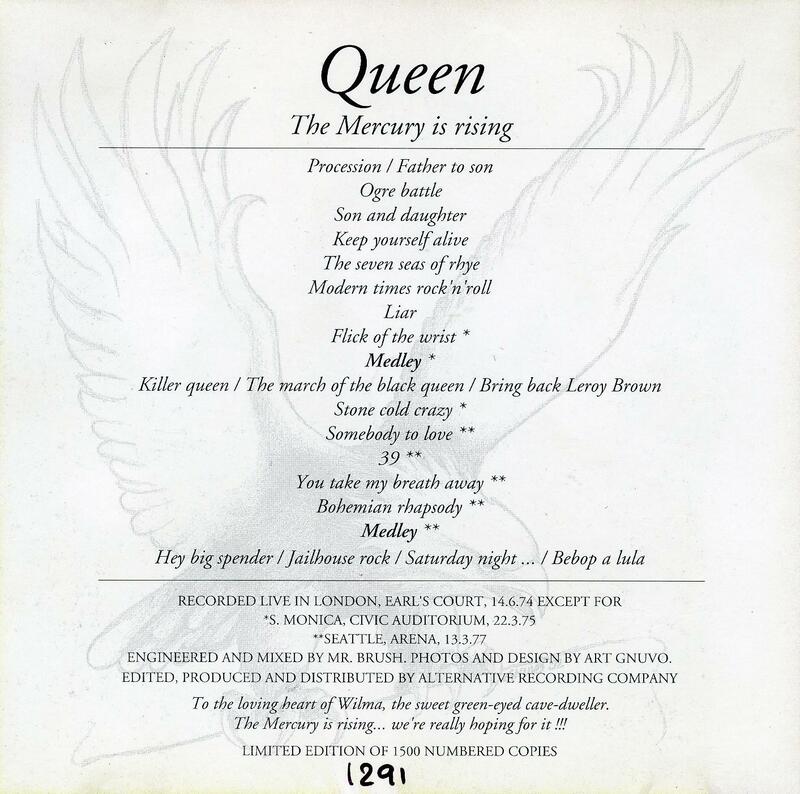 There were various incarnations of the release with different combinations of CDs, DVD, blu-ray and LPs. 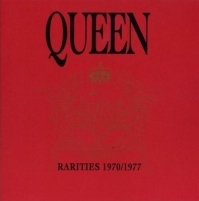 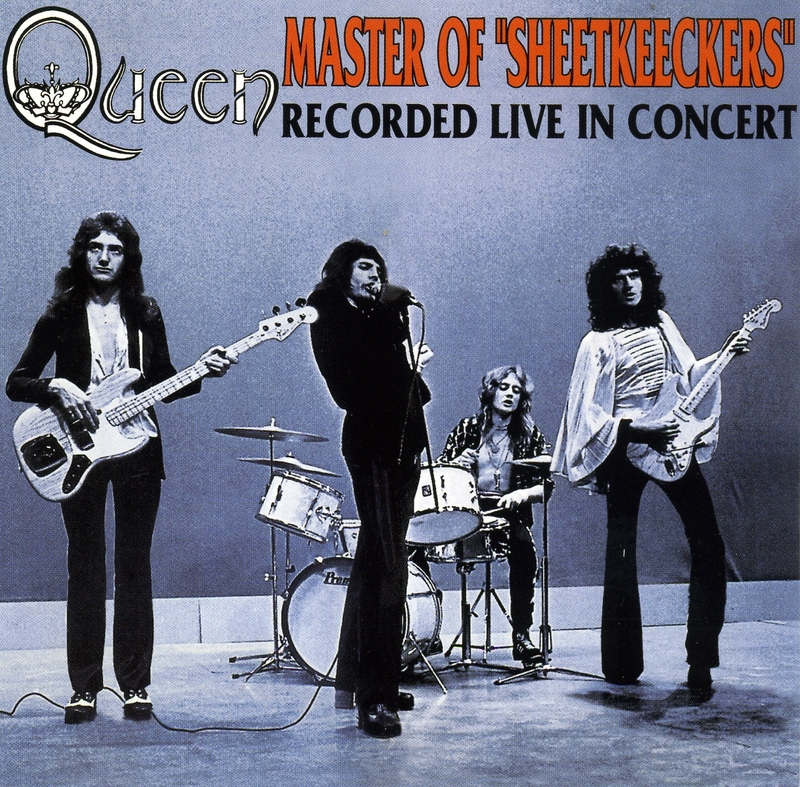 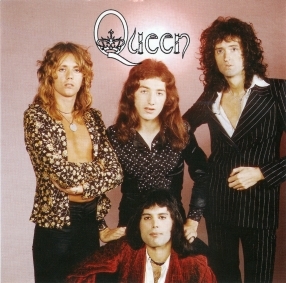 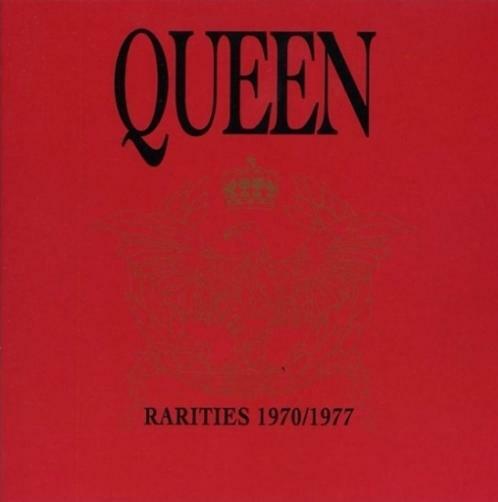 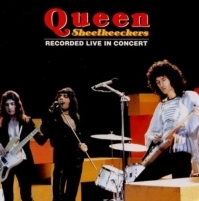 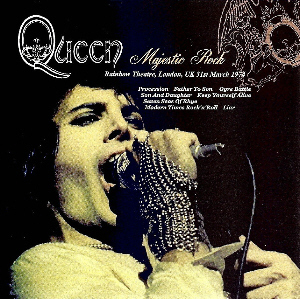 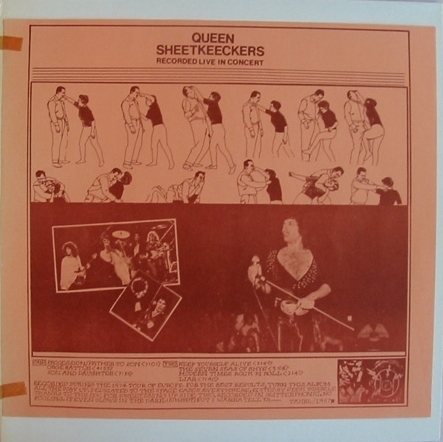 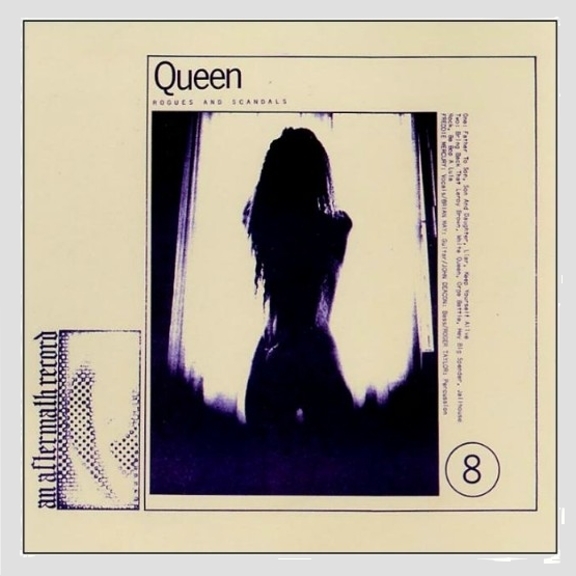 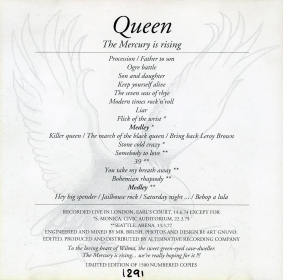 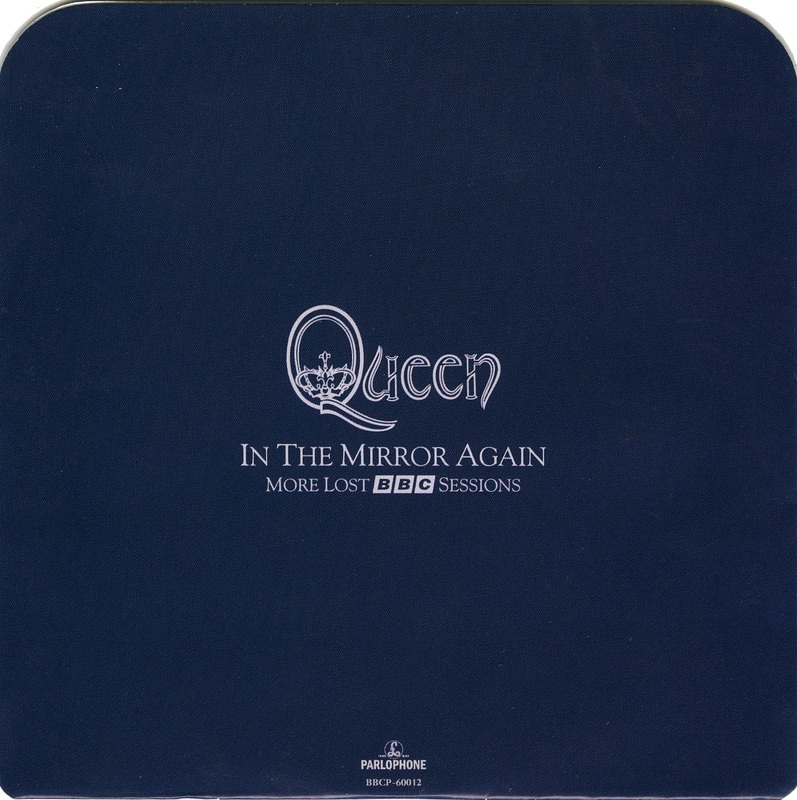 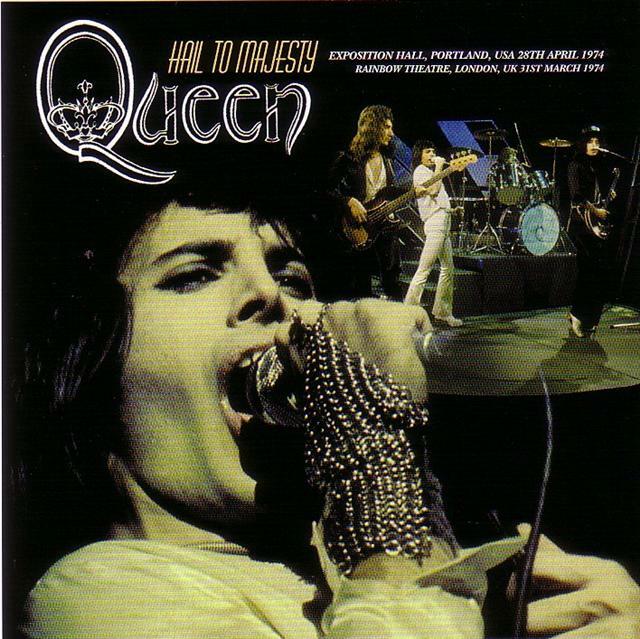 One of the LP versions contained only eight songs from the March show, mimicking what was originally intended to be Queen's first album (the eight tracks that ended up being first released as the Sheetkeeckers bootleg in 1975). 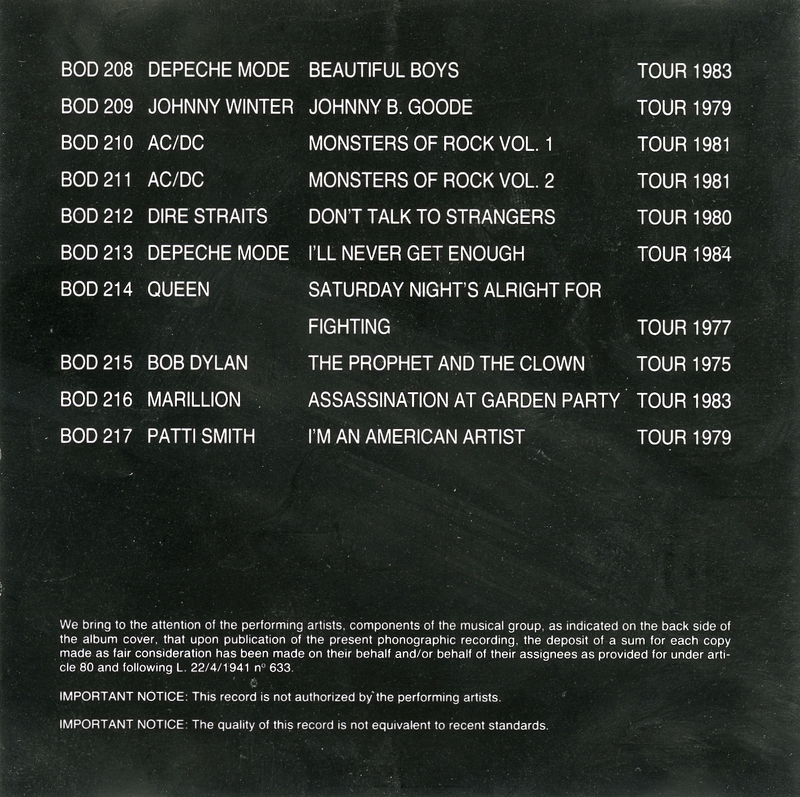 Many of the vocal overdubs heard on the bootleg remain, but largely the March material has had the overdubs minimized. 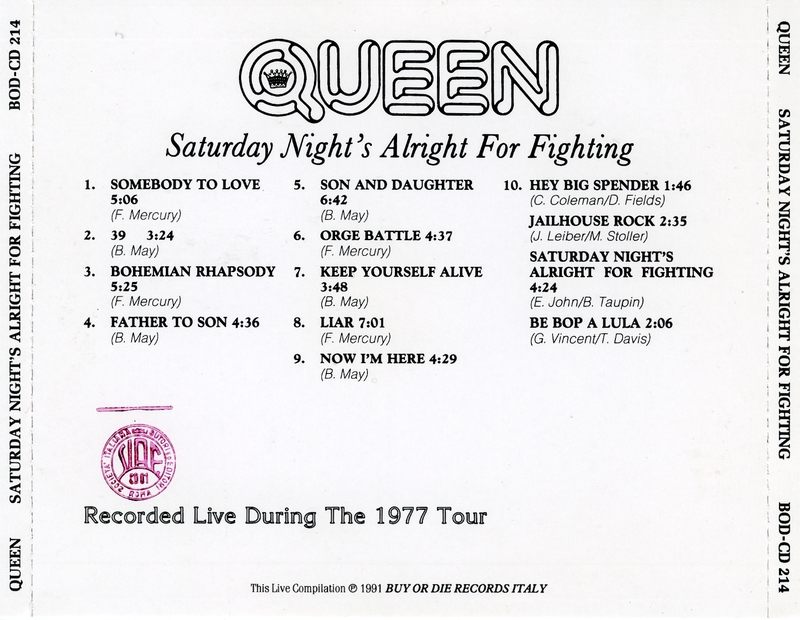 A few further fixes were done on vocals and guitar parts, but it is overwhelmingly an exact representation of what was heard live on this date. 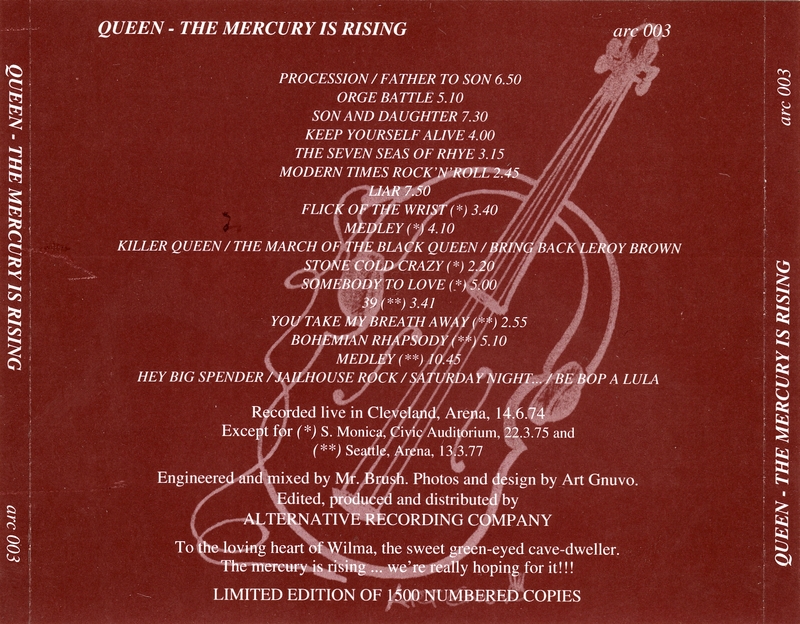 This recording showcases Queen at their heaviest and rawest, and is truly essential listening for any fan of rock music. 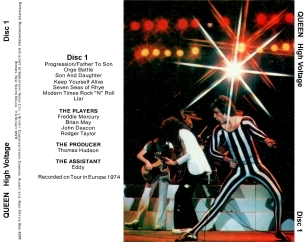 This excellent analysis by Tom Christie details the edits and overdubs in as great detail as possible, using all the raw materials available to the fanbase. 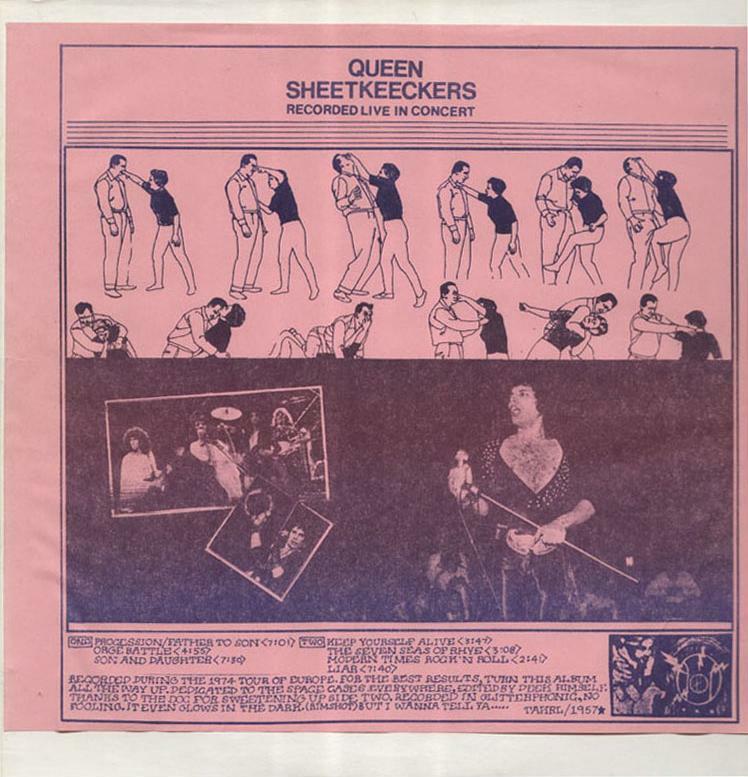 Unbeknownst to most until this release was announced, The Fairy Feller's Master-Stroke off Queen II was performed at this show. 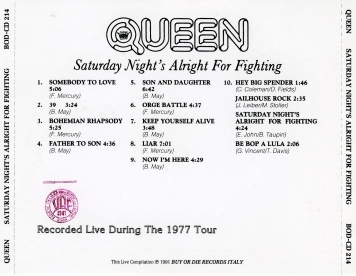 It was played a few times this month, and brief impromptu version of the song was also apparently performed at a California show in 1975 after an audience member shouted for it. Many of the pictures seen above are from Mick Rock's Classic Queen book (the last of which is a brilliant shot of Freddie at the piano for one of his brief bits in Seven Seas Of Rhye). 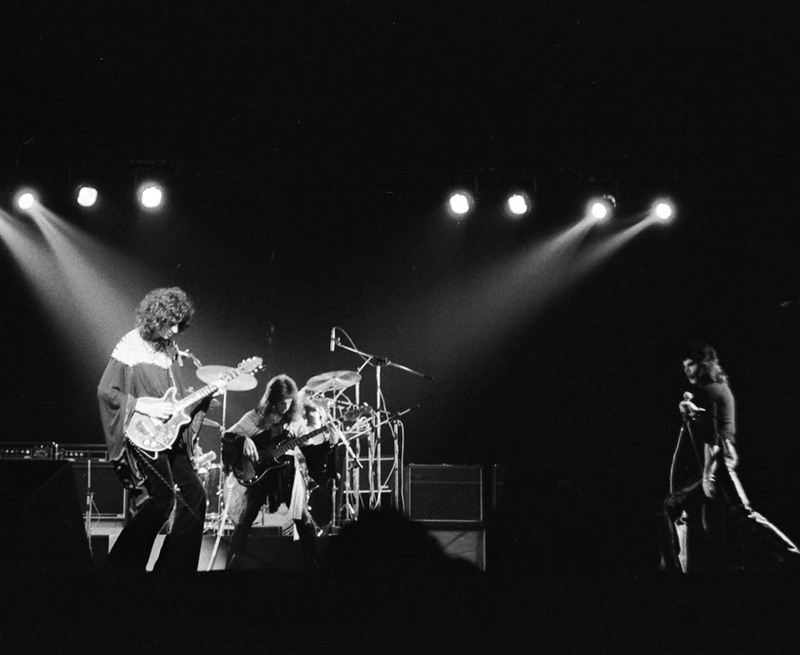 More pictures from this show can be found at http://www.repfoto.com. 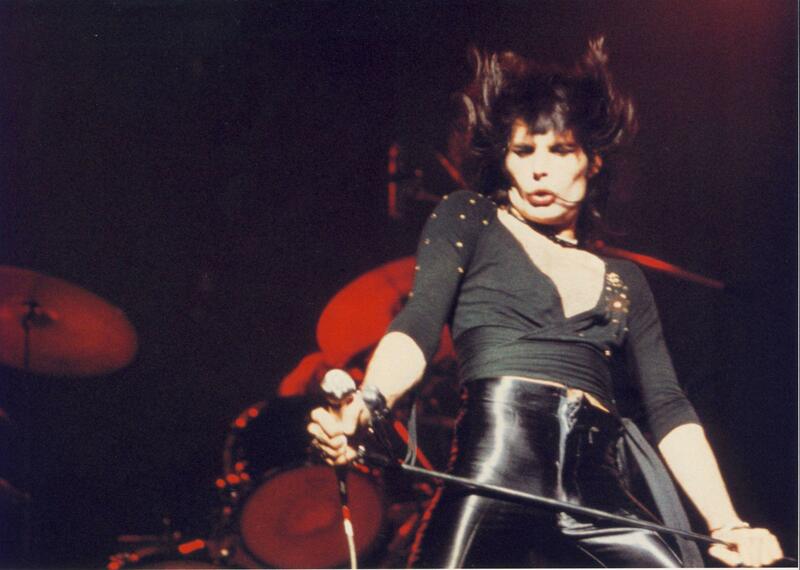 You have to register as a user. 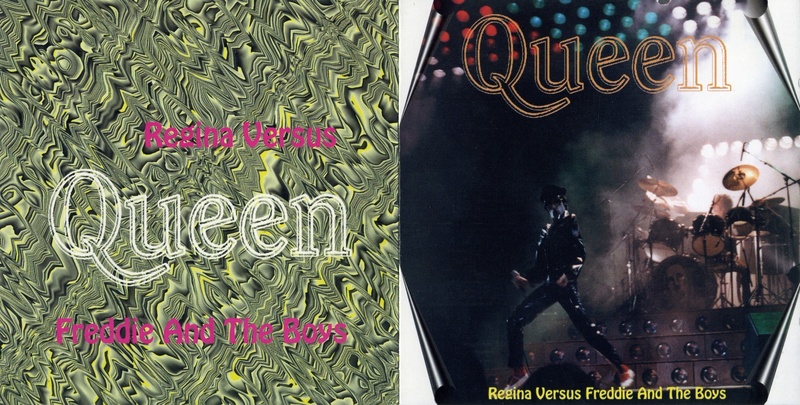 These two songs were shown on Japanese TV as promotional material (Freddie mentions this at the Yokohama '75 show), and also on US TV in 1977. 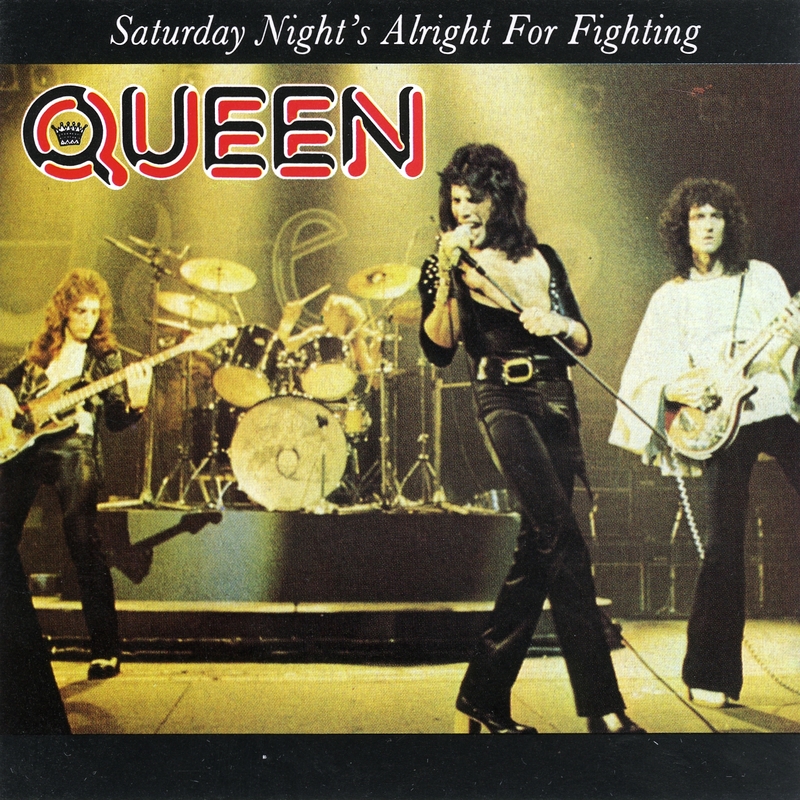 Some of Son And Daughter was broadcast around 2000 on a Swedish TV programe called "Kv�llstoppen", and a few seconds of Modern Times Rock 'n' Roll were seen in the 2002 "When Freddie Met Kenny [Everett, radio DJ]" documentary. 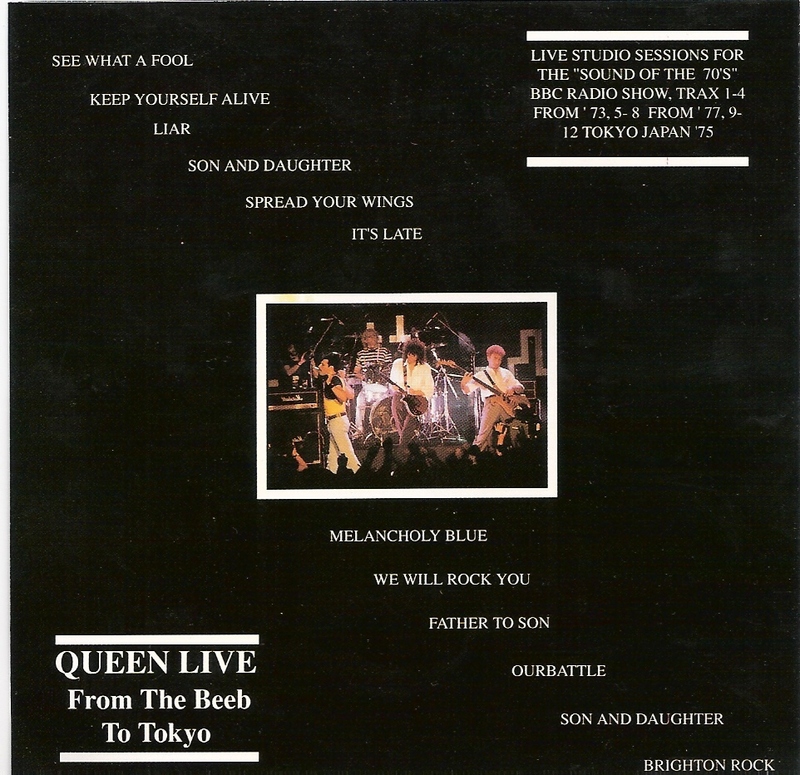 It has all since been officially released as part of the "Live At The Rainbow" package in 2014. 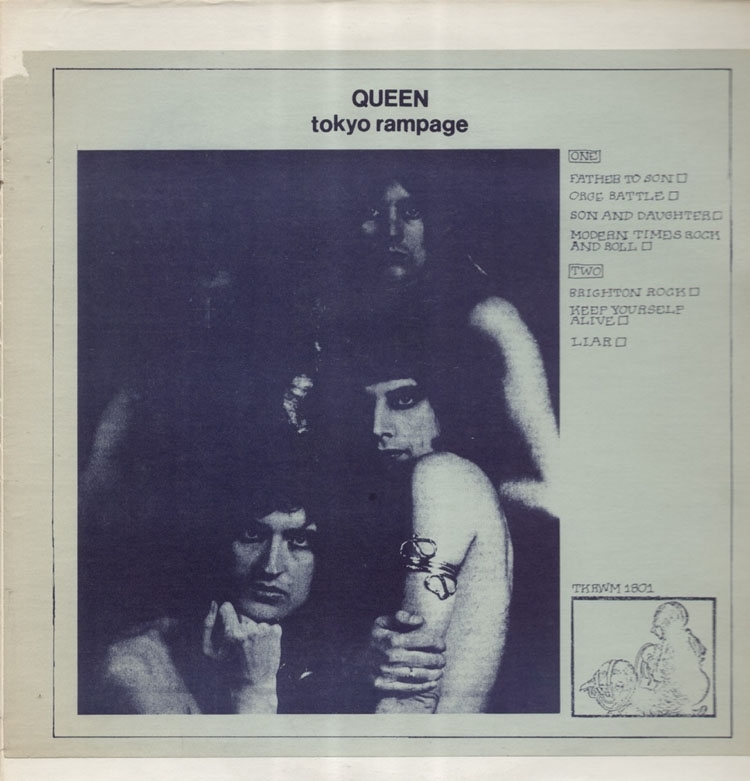 Clips of the two songs were seen in the 2015 BBC documentary "From Rags To Rhapsody" with the original audio, not the remastered 2014 audio. 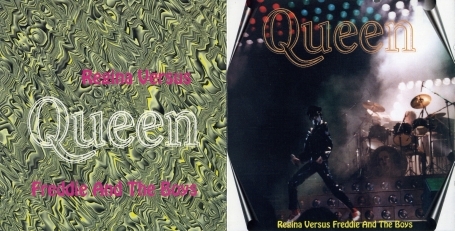 The BBC had a superior video source to the 2014 release as well (see a comparison here). 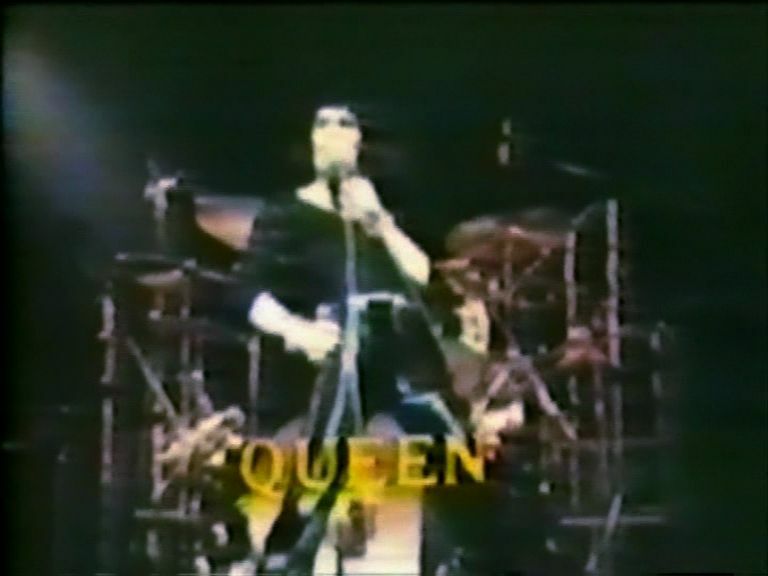 Queen archivist Greg Brooks insists that no other footage from this show exists, although later reports claim as much as 38 minutes of footage are in the vaults. 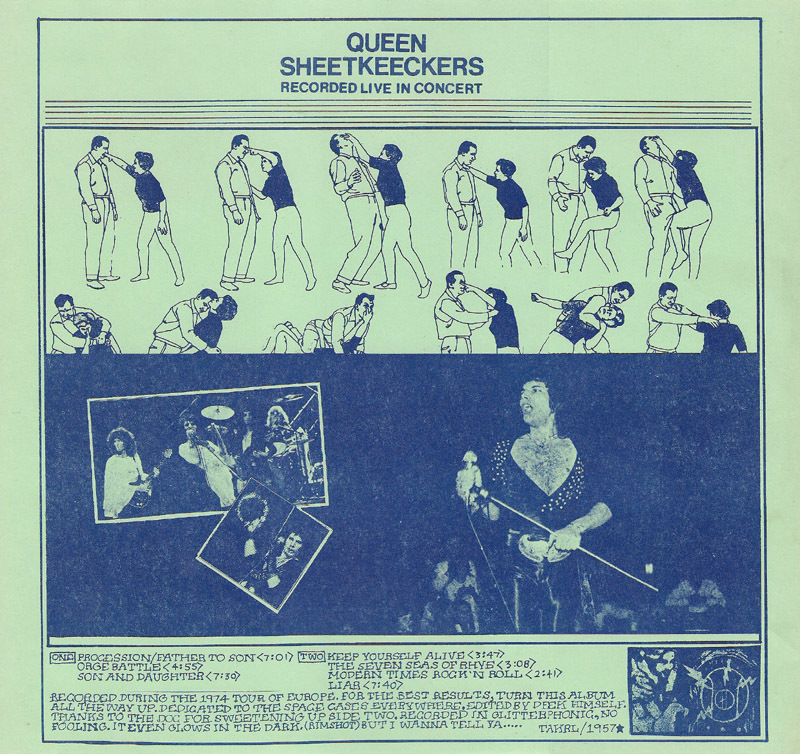 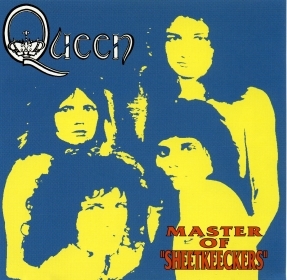 Released in the US in 1975, the Sheetkeeckers LP was the very first Queen bootleg. 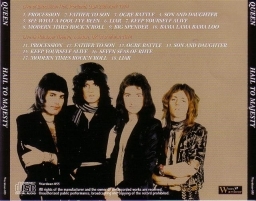 For some reason, Ballroom Blitz by Sweet is tagged onto the end. 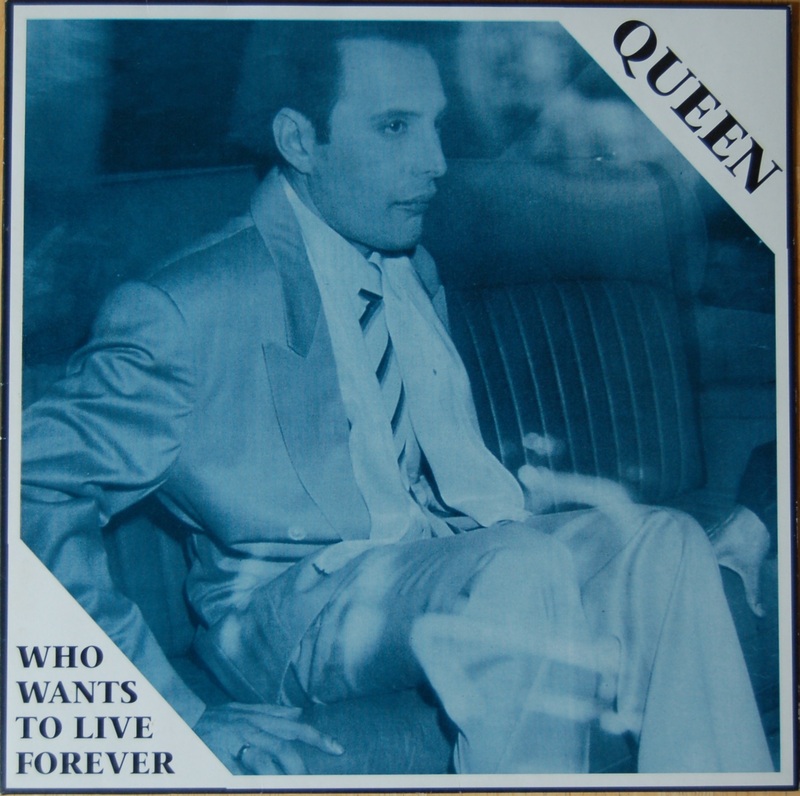 This first release was seen with the "Freddie live" insert. This soundboard recording (multi-track, to be precise, since it certainly has been properly mixed) contains numerous vocal overdubs. 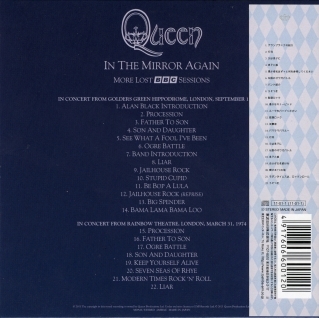 The most glaring example of this is 3 minutes into Liar, when Freddie sings "time after time", and the next line begins before the previous one has ended. 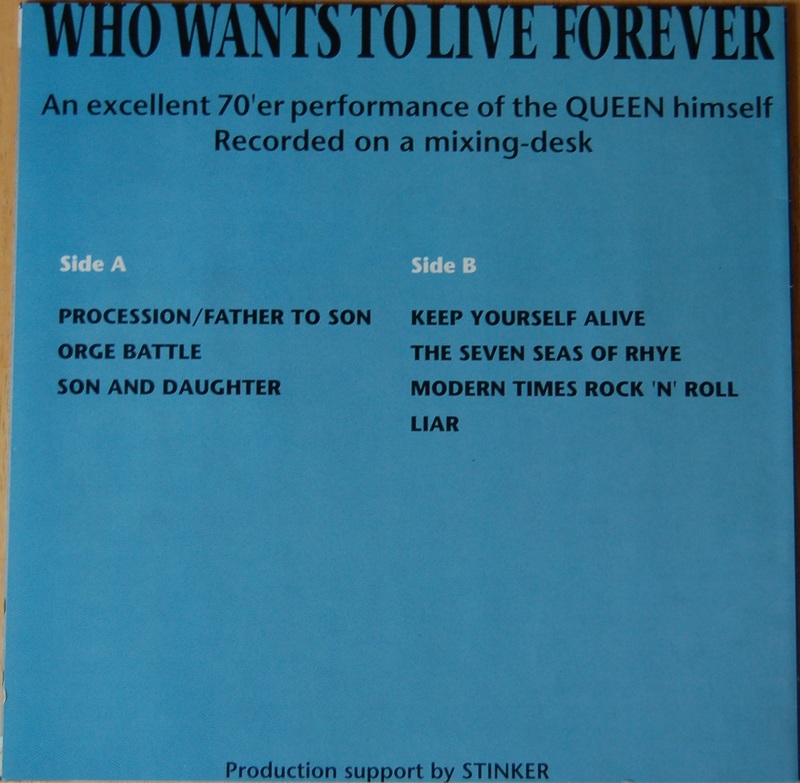 In addition to the overdubs, the fact that it's perfectly mixed, the between-song segments having been edited, and that it's 37 minutes long, this is clear indication that this was considered to be a live album by the band. 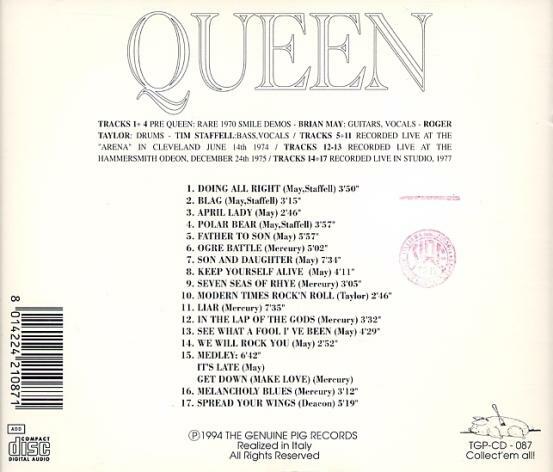 Naturally, the cover songs were omitted so that they wouldn't have had to pay any royalties. 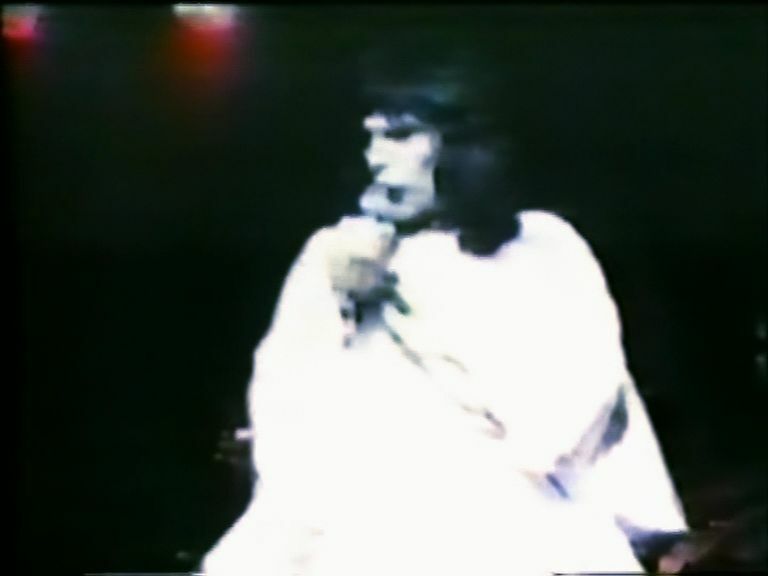 Freddie asking the audience "What comes next?" 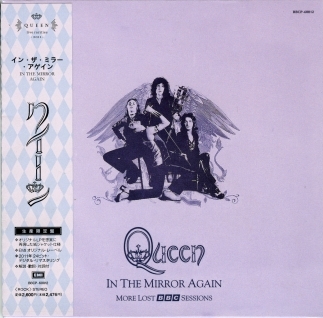 (between "I want you" and "To be a woman") during the second chorus of Son And Daughter is cut out on this audio source. 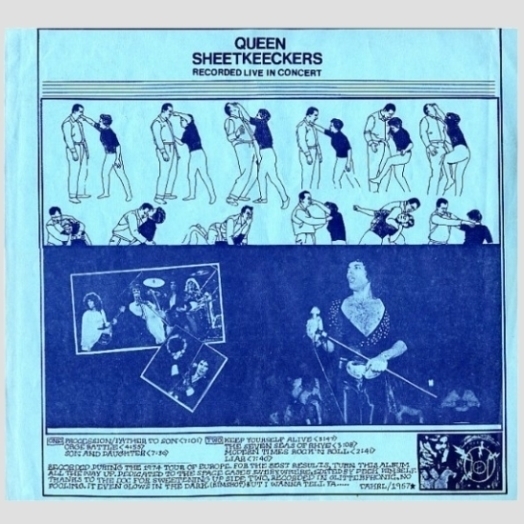 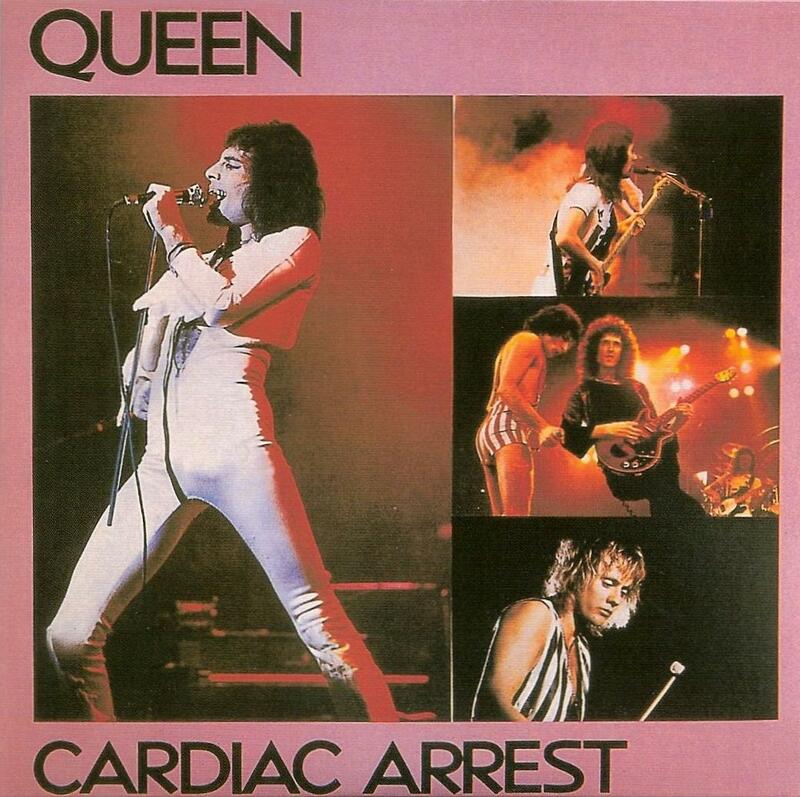 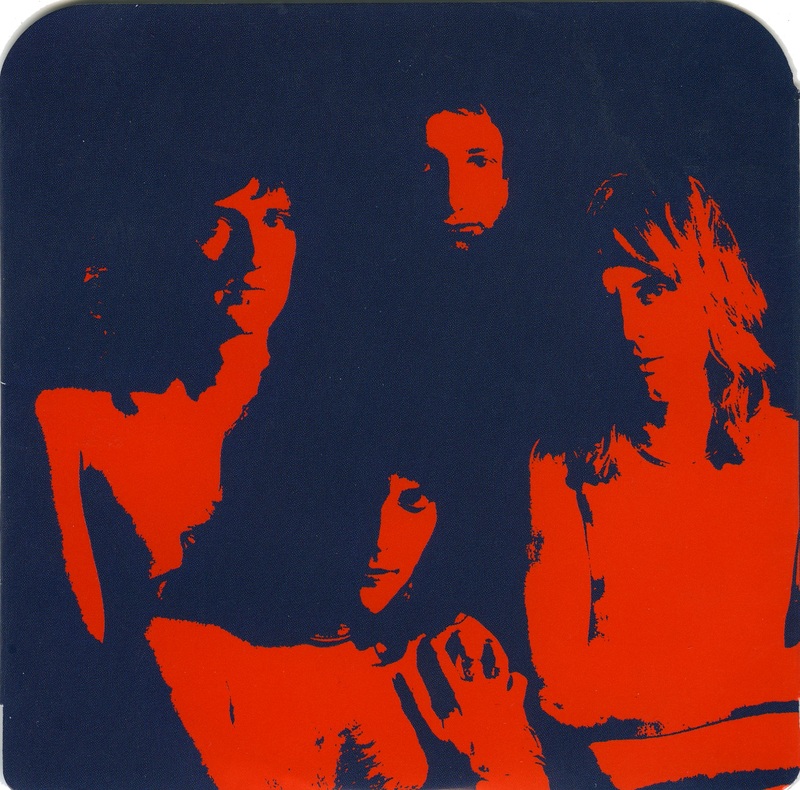 In 1975, the Sheffield brothers, who were still managing Queen at the time, wanted to release this as the band's third album, and Queen rejected the idea as they wanted to focus on creating new music instead. 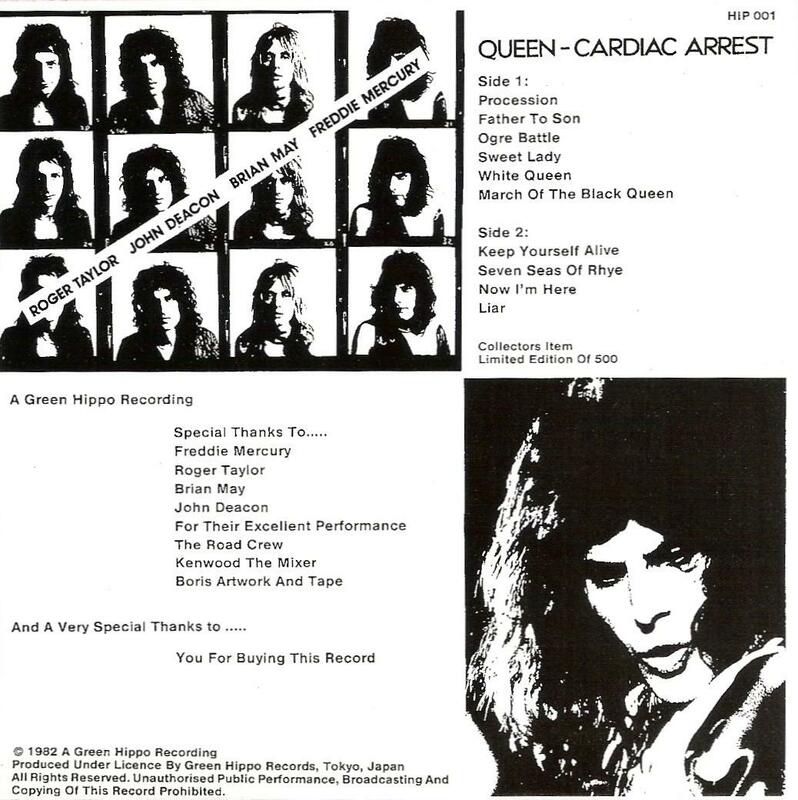 Within months Queen changed management rather acrimoniously, and tapes of this show ended up in the hands of bootleggers. 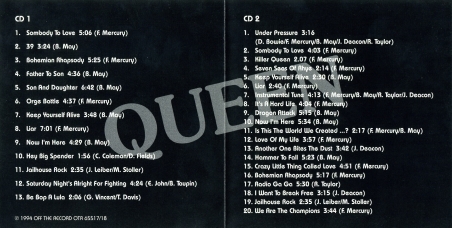 The version heard is allegedly Roy Thomas Baker's mix. 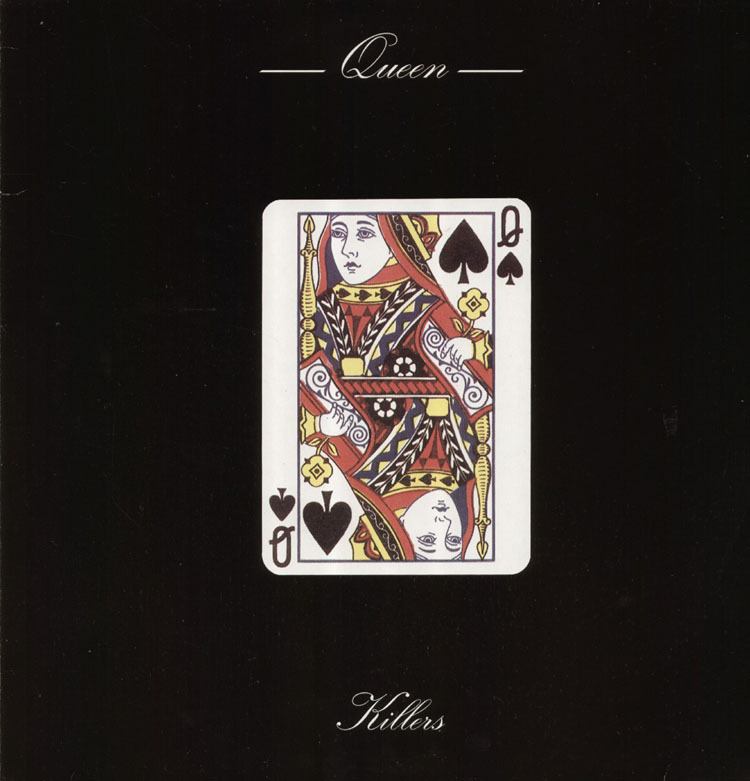 The band's first officially released live album would eventually come in 1979, in the form of Live Killers. 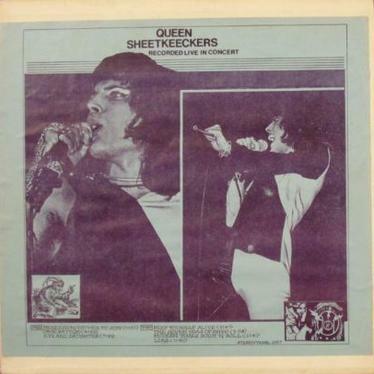 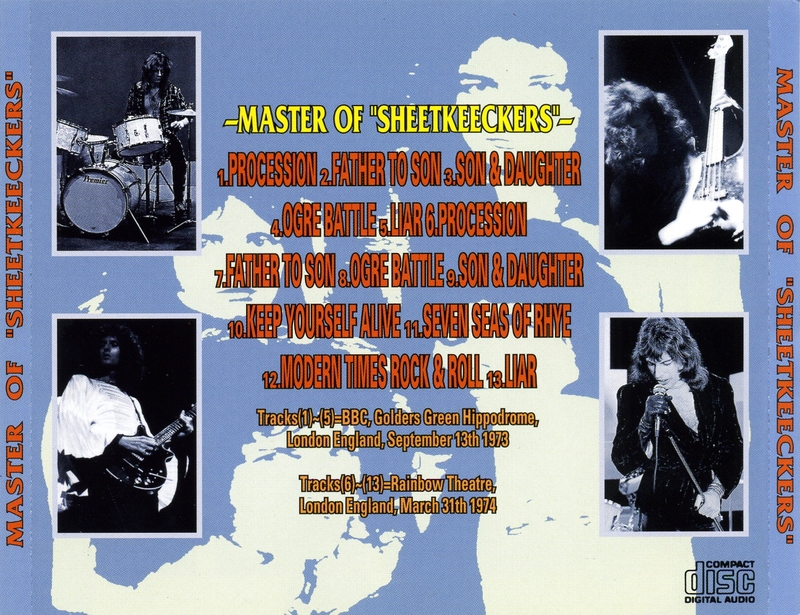 There were several re-pressings of the Sheetkeekers bootleg in 1975, with what became known as the "self-defence" insert. 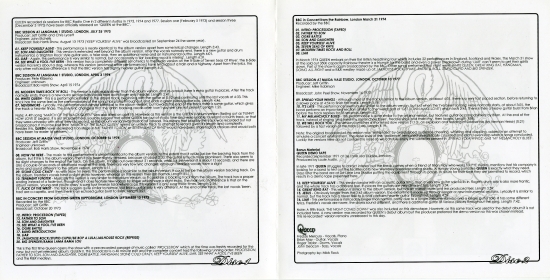 Thanks to Andreas Voigts for these scans, and countless others. 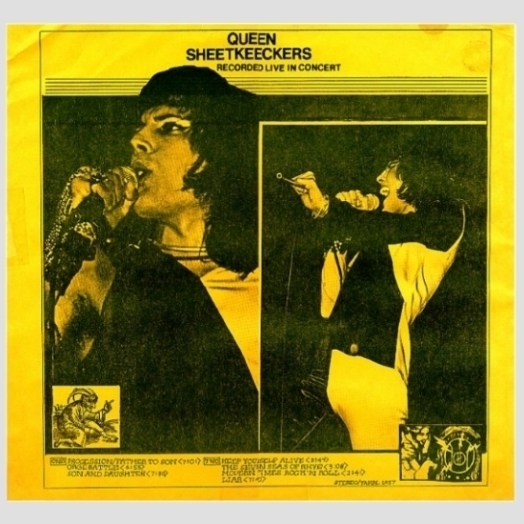 Plenty of other LP and CD bootlegs sourced from the Sheetkeeckers LP have emerged over the years, many of which attempted to diguise the recording as other dates. 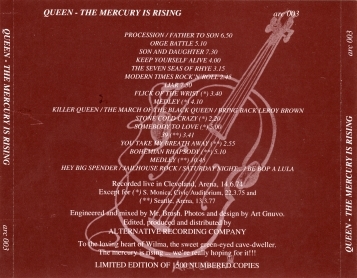 The last one is a vinyl release from 2007. 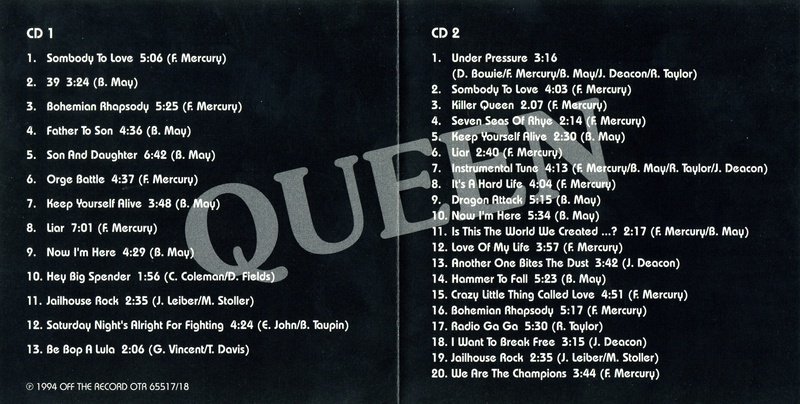 This reel-to-reel tape from Elektra Records dated January 27, 1975 is an excellent pre-LP copy of this recording. 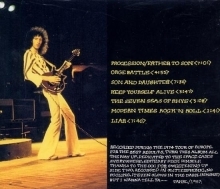 There is an extra 50 seconds of audience cheering after Liar than the LPs, and one second of Keep Yourself Alive is missing in the right channel. 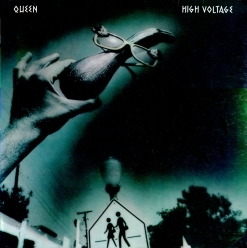 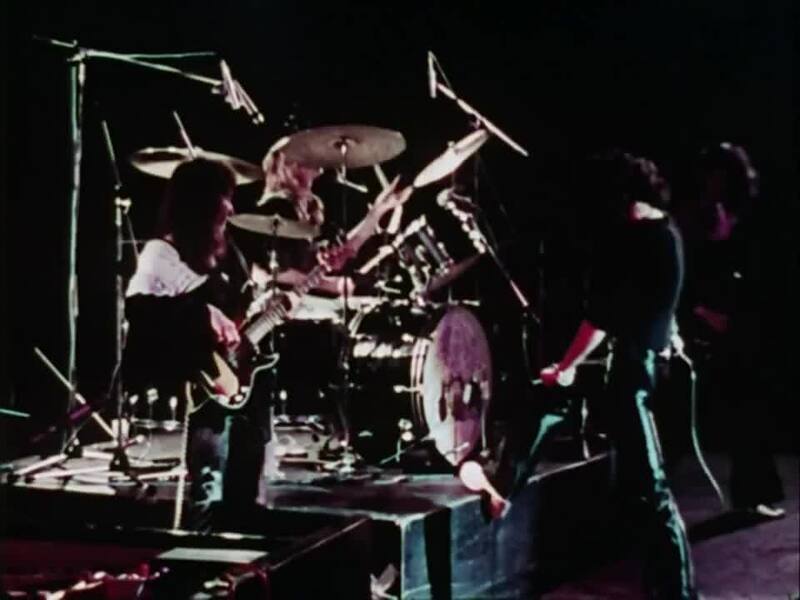 Although an Elektra engineer is mentioned on the tape box, the vocal overdubs were almost certainly done by the band in the UK between tour legs (in fact, Queen flew to the US on January 31, 1975 to rehearse for their first headlining tour there, four days after the date indicated on the box). 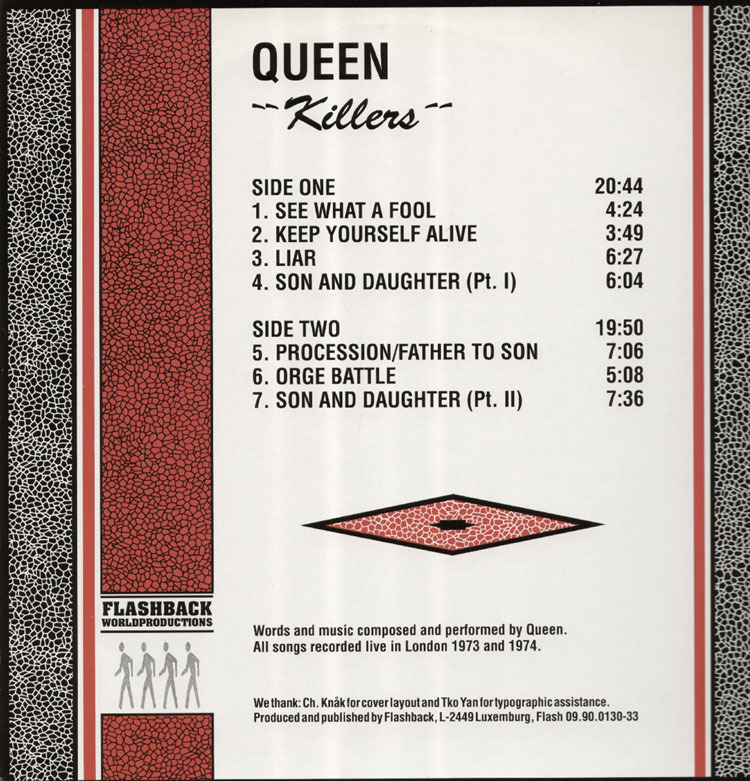 This pre-LP cassette sounds a bit better than the Elektra reel, although it's not quite as complete. The beginnings of Procession and Liar were missing and dubbed in from a cassette of the Sheetkeeckers LP. 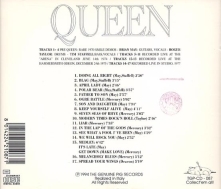 These five tracks are from a 1975 radio show. 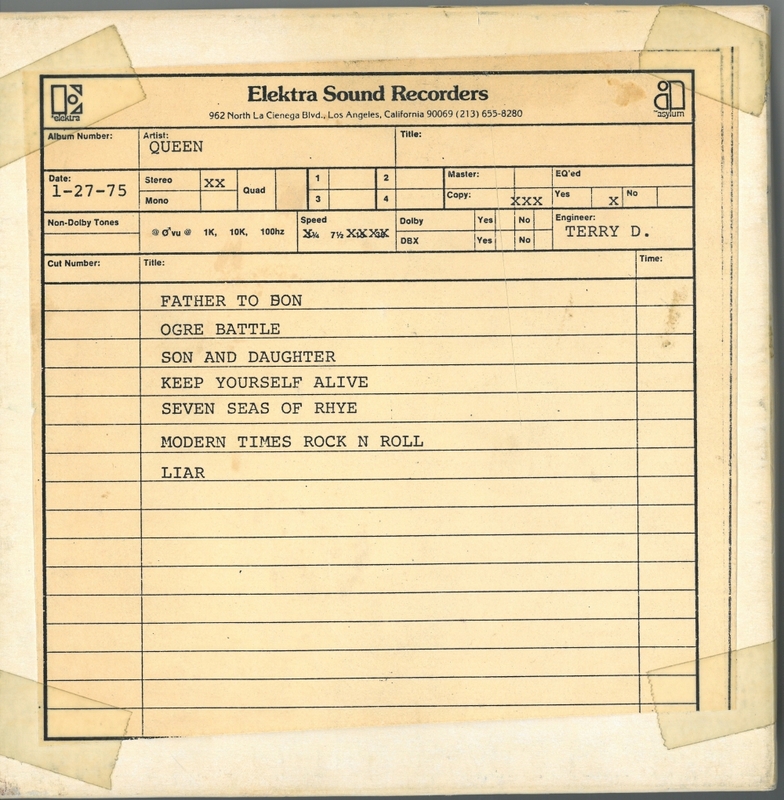 A recording from the airwaves has never emerged, but this is a direct transfer of the reel-to-reel tape intended for broadcast. 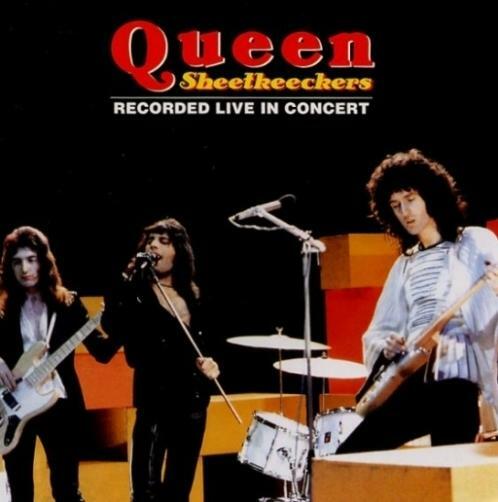 The quality is superb - until the 2014 official release this was the best-sounding version of the concert. 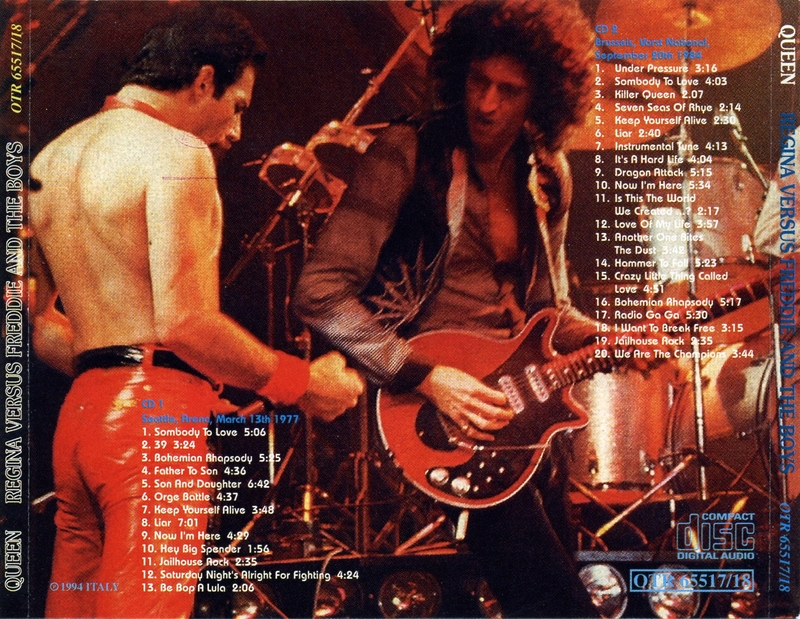 An interview with the band was also part of the broadcast, along with studio tracks from a few other bands, including Nutz, who supported Queen on this tour. 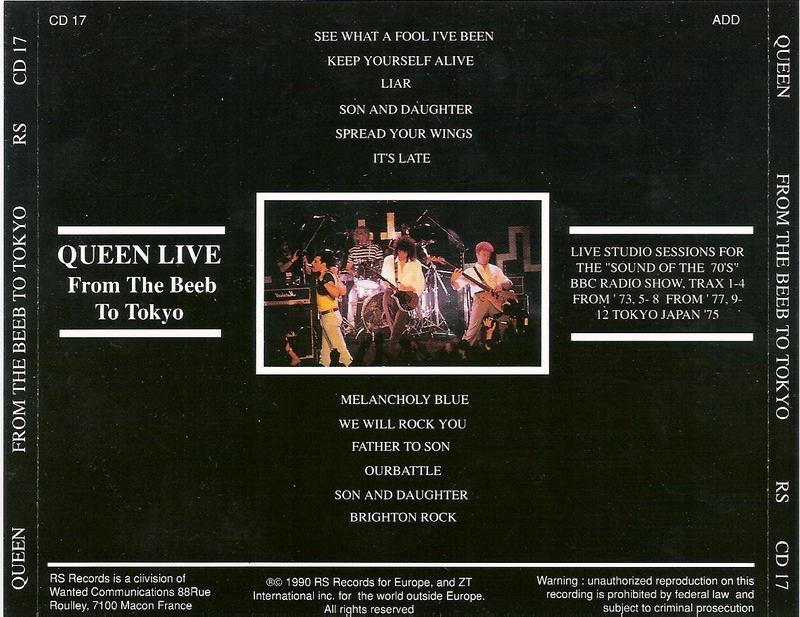 With FM radio's often daring nature in the early to mid 70s, it's entirely possible that this tape was acquired and broadcast without the band's consent - the list of credits on the bottom of the cue sheet are dubious. 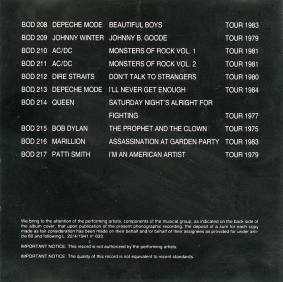 Wardour bootlegged the cassette pre-LP source in April 2008. It was a bonus CDR with their release of Kobe '75 called "Dressed To Kill". Wardour tagged on the same pre-LP copy (even though they had already released it as "Majestic Rock" a couple years earlier) to their bootleg of the Portland '74 master tape. 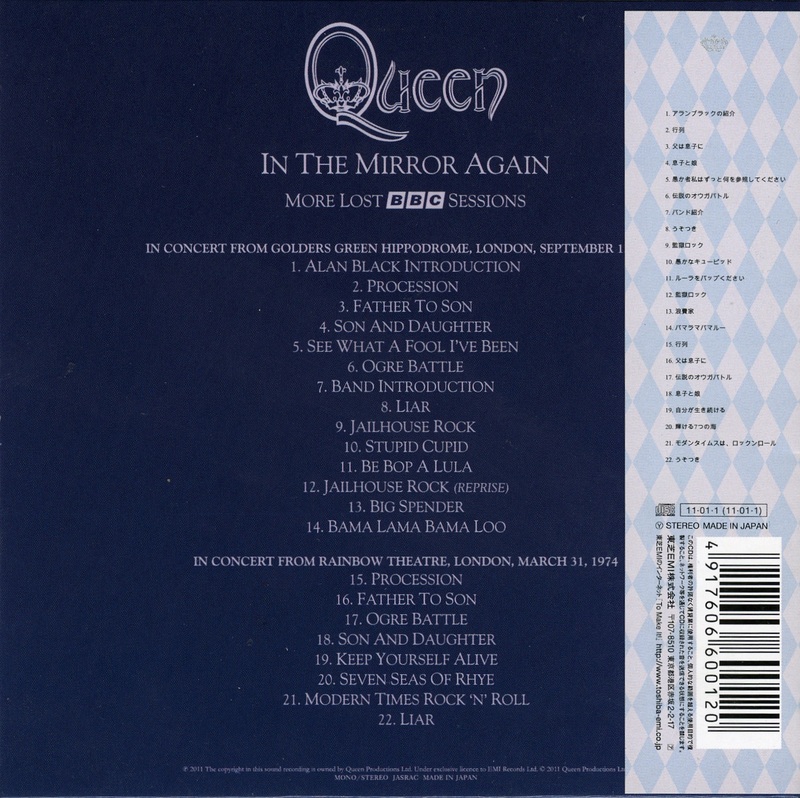 In order to fit both shows onto the same disc, they had to chop off a couple minutes of Liar. 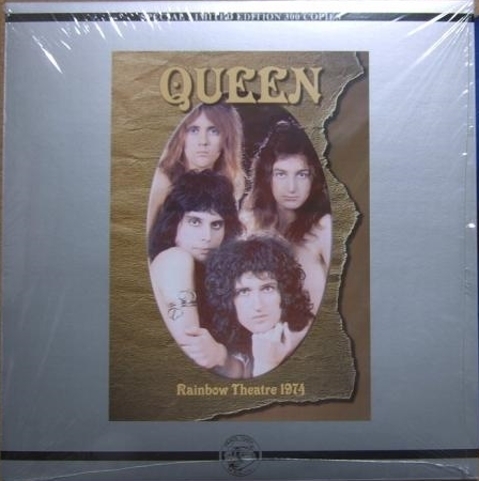 A DVD of the November Rainbow show is included as a bonus disc. 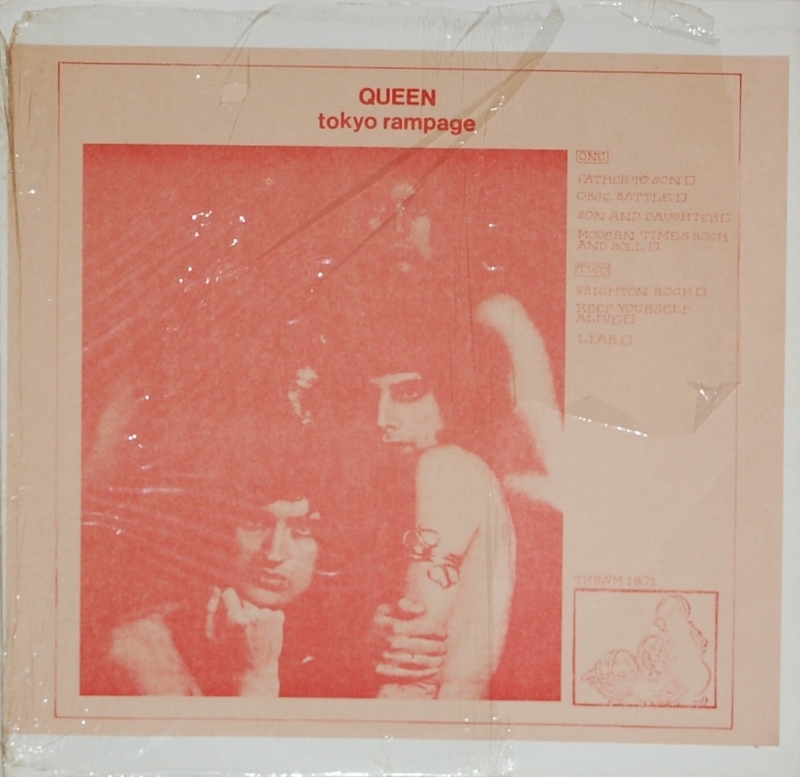 The packaging makes it appear to be like the 2001 Japanese mini-LP re-releases of the studio albums, but this is actually a bootleg made in Russia. 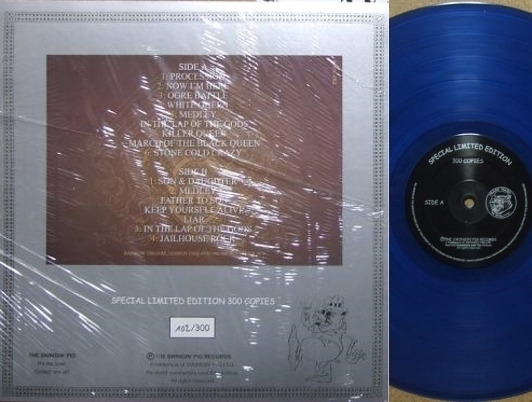 It is yet another version of the Golders Green and Rainbow material, most likely straight copies of the Godfather and Wardour bootlegs respectively.